The full results of our second advanced-detector observing run (O2) have now been released—we’re pleased to announce four new gravitational wave signals: GW170729, GW170809, GW170818 and GW170823 [bonus note]. These latest observations are all of binary black hole systems. Together, they bring our total to 10 observations of binary black holes, and 1 of a binary neutron star. With more frequent detections on the horizon with our third observing run due to start early 2019, the era of gravitational wave astronomy is truly here. The population of black holes and neutron stars observed with gravitational waves and with electromagnetic astronomy. You can play with an interactive version of this plot online. The new detections are largely consistent with our previous findings. GW170809, GW170818 and GW170823 are all similar to our first detection GW150914. Their black holes have masses around 20 to 40 times the mass of our Sun. I would lump GW170104 and GW170814 into this class too. Although there were models that predicted black holes of these masses, we weren’t sure they existed until our gravitational wave observations. The family of black holes continues out of this range. GW151012, GW151226 and GW170608 fall on the lower mass side. These overlap with the population of black holes previously observed in X-ray binaries. Lower mass systems can’t be detected as far away, so we find fewer of these. On the higher end we have GW170729 [bonus note]. Its source is made up of black holes with masses and (where is the mass of our Sun). The larger black hole is a contender for the most massive black hole we’ve found in a binary (the other probable contender is GW170823’s source, which has a black hole). We have a big happy family of black holes! Of the new detections, GW170729, GW170809 and GW170818 were both observed by the Virgo detector as well as the two LIGO detectors. Virgo joined O2 for an exciting August [bonus note], and we decided that the data at the time of GW170729 were good enough to use too. Unfortunately, Virgo wasn’t observing at the time of GW170823. GW170729 and GW170809 are very quiet in Virgo, you can’t confidently say there is a signal there [bonus note]. However, GW170818 is a clear detection like GW170814. Well done Virgo! Using the collection of results, we can start understand the physics of these binary systems. We will be summarising our findings in a series of papers. A huge amount of work went into these. The paper summarises all our observations of binaries to date. It covers our first and second observing runs (O1 and O2). This is the paper to start with if you want any information. It contains estimates of parameters for all our sources, including updates for previous events. It also contains merger rate estimates for binary neutron stars and binary black holes, and an upper limit for neutron star–black hole binaries. 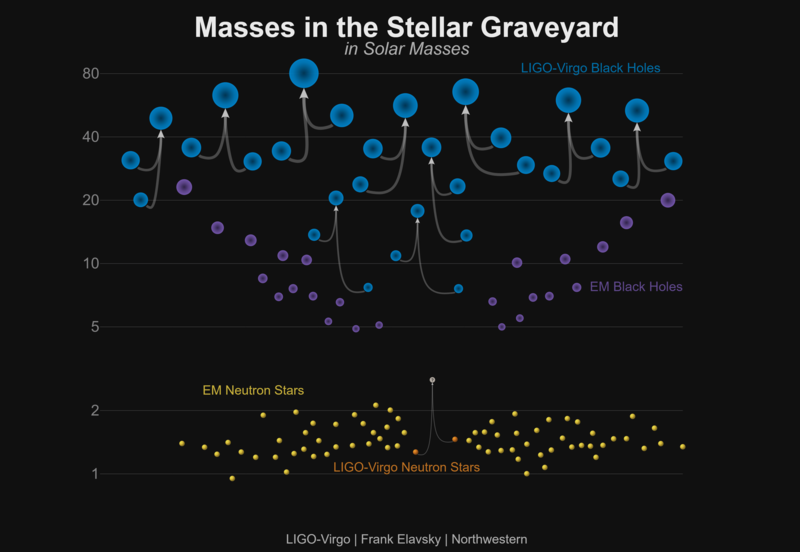 We’re still missing a neutron star–black hole detection to complete the set. Using our set of ten binary black holes, we can start to make some statistical statements about the population: the distribution of masses, the distribution of spins, the distribution of mergers over cosmic time. With only ten observations, we still have a lot of uncertainty, and can’t make too many definite statements. However, if you were wondering why we don’t see any more black holes more massive than GW170729, even though we can see these out to significant distances, so are we. We infer that almost all stellar-mass black holes have masses less than . This is a BIG paper. It covers our first two observing runs and our main searches for coalescing stellar mass binaries. There will be separate papers going into more detail on searches for other gravitational wave signals. Gravitational wave detectors are complicated machines. You don’t just take them out of the box and press go. We’ll be slowly improving the sensitivity of our detectors as we commission them over the next few years. O2 marks the best sensitivity achieved to date. The paper gives a brief overview of the detector configurations in O2 for both LIGO detectors, which did differ, and Virgo. During O2, we realised that one source of noise was beam jitter, disturbances in the shape of the laser beam. This was particularly notable in Hanford, where there was a spot on the one of the optics. Fortunately, we are able to measure the effects of this, and hence subtract out this noise. This has now been done for the whole of O2. It makes a big difference! 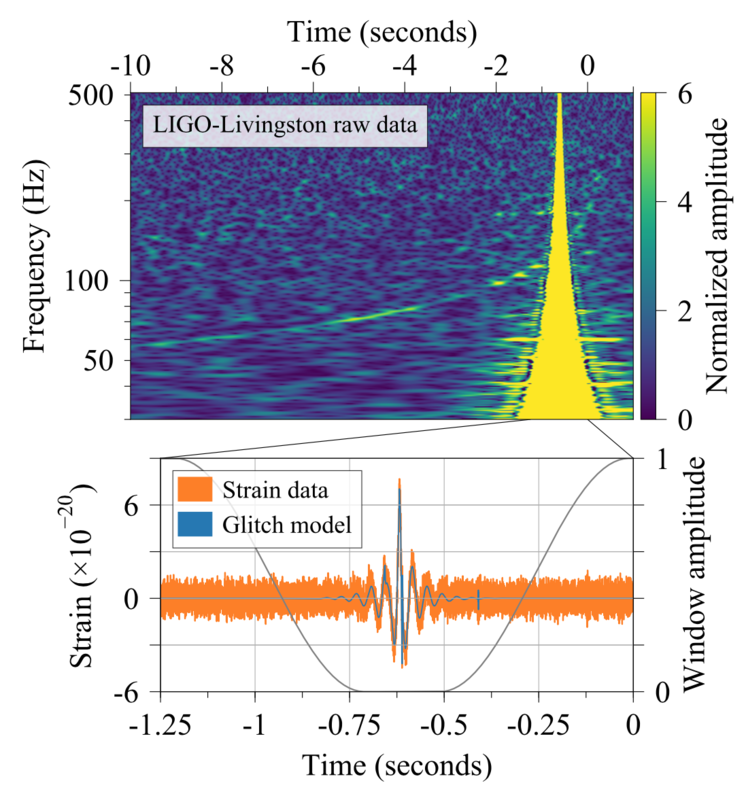 Derek Davis and TJ Massinger won the first LIGO Laboratory Award for Excellence in Detector Characterization and Calibration™ for implementing this noise subtraction scheme (the award citation almost spilled the beans on our new detections). I’m happy that GW170104 now has an increased signal-to-noise ratio, which means smaller uncertainties on its parameters. We use three search algorithms in this paper. We have two matched-filter searches (GstLAL and PyCBC). These compare a bank of templates to the data to look for matches. We also use coherent WaveBurst (cWB), which is a search for generic short signals, but here has been tuned to find the characteristic chirp of a binary. Since cWB is more flexible in the signals it can find, it’s slightly less sensitive than the matched-filter searches, but it gives us confidence that we’re not missing things. 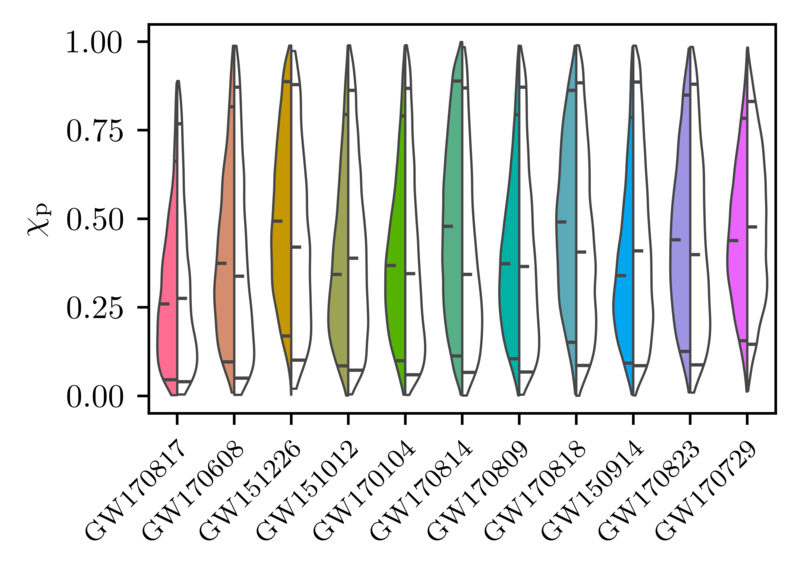 The two matched-filter searches both identify all 11 signals with the exception of GW170818, which is only found by GstLAL. This is because PyCBC only flags signals above a threshold in each detector. We’re confident it’s real though, as it is seen in all three detectors, albeit below PyCBC’s threshold in Hanford and Virgo. (PyCBC only looked at signals found in coincident Livingston and Hanford in O2, I suspect they would have found it if they were looking at all three detectors, as that would have let them lower their threshold). The search pipelines try to distinguish between signal-like features in the data and noise fluctuations. Having multiple detectors is a big help here, although we still need to be careful in checking for correlated noise sources. The background of noise falls off quickly, so there’s a rapid transition between almost-certainly noise to almost-certainly signal. Most of the signals are off the charts in terms of significance, with GW170818, GW151012 and GW170729 being the least significant. 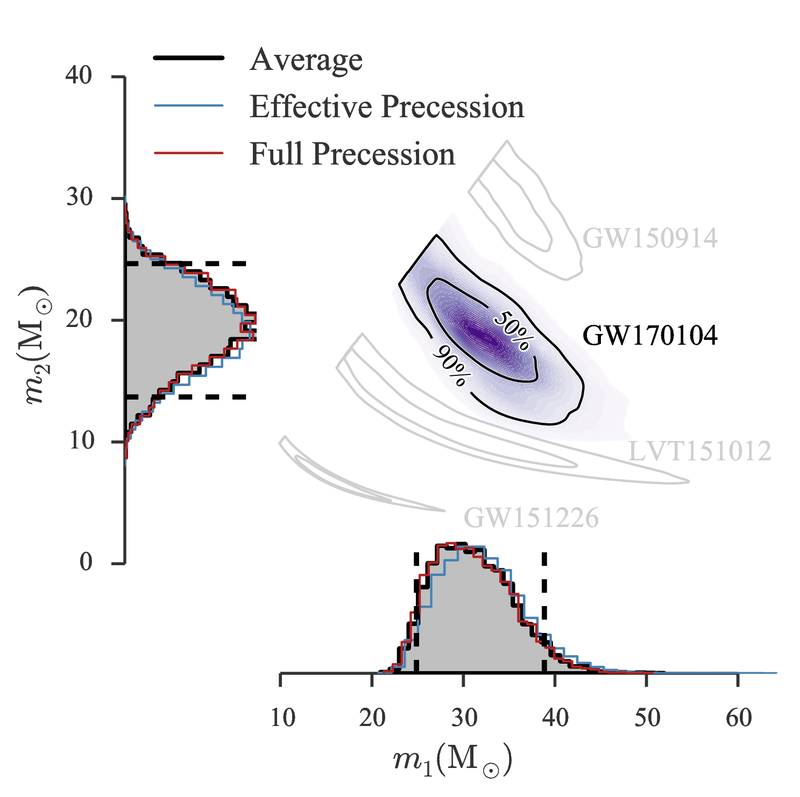 GW170729 is found with best significance by cWB, that gives reports a false alarm rate of . Cumulative histogram of results from GstLAL (top left), PyCBC (top right) and cWB (bottom). The expected background is shown as the dashed line and the shaded regions give Poisson uncertainties. The search results are shown as the solid red line and named gravitational-wave detections are shown as blue dots. More significant results are further to the right of the plot. Fig. 2 and Fig. 3 of the O2 Catalogue Paper. The false alarm rate indicates how often you would expect to find something at least as signal like if you were to analyse a stretch of data with the same statistical properties as the data considered, assuming that they is only noise in the data. The false alarm rate does not fold in the probability that there are real gravitational waves occurring at some average rate. Therefore, we need to do an extra layer of inference to work out the probability that something flagged by a search pipeline is a real signal versus is noise. The results of this calculation is given in Table IV. GW170729 has a 94% probability of being real using the cWB results, 98% using the GstLAL results, but only 52% according to PyCBC. Therefore, if you’re feeling bold, you might, say, only wager the entire economy of the UK on it being real. We also list the most marginal triggers. These all have probabilities way below being 50% of being real: if you were to add them all up you wouldn’t get a total of 1 real event. (In my professional opinion, they are garbage). However, if you want to check for what we might have missed, these may be a place to start. Some of these can be explained away as instrumental noise, say scattered light. Others show no obvious signs of disturbance, so are probably just some noise fluctuation. We give updated parameter estimates for all 11 sources. These use updated estimates of calibration uncertainty (which doesn’t make too much difference), improved estimate of the noise spectrum (which makes some difference to the less well measured parameters like the mass ratio), the cleaned data (which helps for GW170104), and our most currently complete waveform models [bonus note]. This plot shows the masses of the two binary components (you can just make out GW170817 down in the corner). We use the convention that the more massive of the two is and the lighter is . We are now really filling in the mass plot! 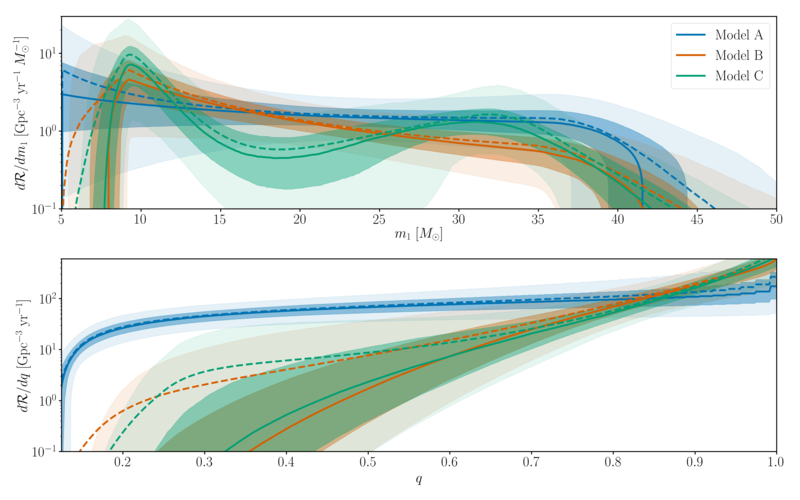 Implications for the population of black holes are discussed in the Populations Paper. Estimated masses for the two binary objects for each of the events in O1 and O2. From lowest chirp mass (left; red) to highest (right; purple): GW170817 (solid), GW170608 (dashed), GW151226 (solid), GW151012 (dashed), GW170104 (solid), GW170814 (dashed), GW170809 (dashed), GW170818 (dashed), GW150914 (solid), GW170823 (dashed), GW170729 (solid). The contours mark the 90% credible regions. The grey area is excluded from our convention on masses. Part of Fig. 4 of the O2 Catalogue Paper. The mass ratio is . As well as mass, black holes have a spin. For the final black hole formed in the merger, these spins are always around 0.7, with a little more or less depending upon which way the spins of the two initial black holes were pointing. As well as being probably the most most massive, GW170729’s could have the highest final spin! It is a record breaker. 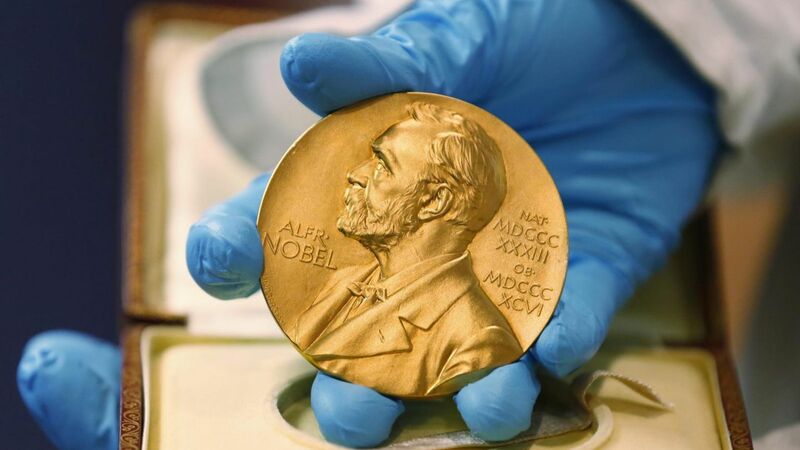 It radiated a colossal worth of energy in gravitational waves [bonus note]. Estimated final masses and spins for each of the binary black hole events in O1 and O2. 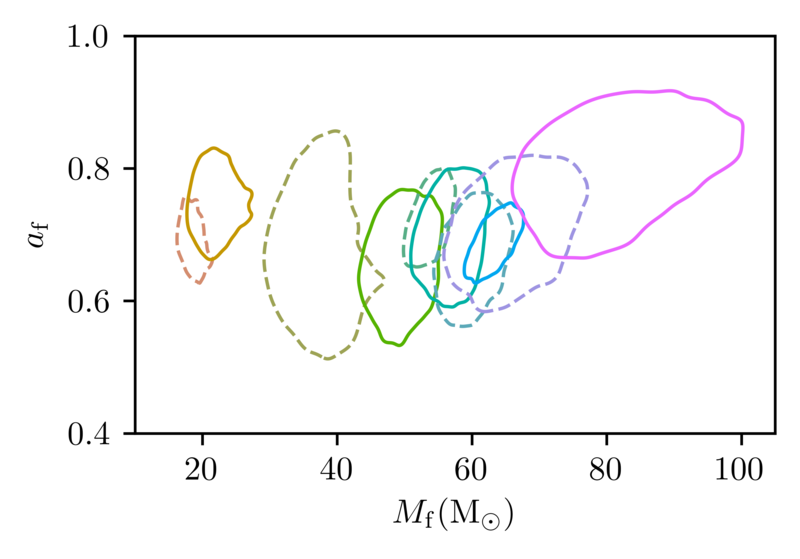 From lowest chirp mass (left; red–orange) to highest (right; purple): GW170608 (dashed), GW151226 (solid), GW151012 (dashed), GW170104 (solid), GW170814 (dashed), GW170809 (dashed), GW170818 (dashed), GW150914 (solid), GW170823 (dashed), GW170729 (solid). The contours mark the 90% credible regions. Part of Fig. 4 of the O2 Catalogue Paper. There is considerable uncertainty on the spins as there are hard to measure. The best combination to pin down is the effective inspiral spin parameter . This is a mass weighted combination of the spins which has the most impact on the signal we observe. It could be zero if the spins are misaligned with each other, point in the orbital plane, or are zero. If it is non-zero, then it means that at least one black hole definitely has some spin. GW151226 and GW170729 have with more than 99% probability. The rest are consistent with zero. The spin distribution for GW170104 has tightened up for GW170104 as its signal-to-noise ratio has increased, and there’s less support for negative , but there’s been no move towards larger positive . Estimated effective inspiral spin parameters for each of the events in O1 and O2. From lowest chirp mass (left; red) to highest (right; purple): GW170817, GW170608, GW151226, GW151012, GW170104, GW170814, GW170809, GW170818, GW150914, GW170823, GW170729. Part of Fig. 5 of the O2 Catalogue Paper. For our analysis, we use two different waveform models to check for potential sources of systematic error. They agree pretty well. The spins are where they show most difference (which makes sense, as this is where they differ in terms of formulation). For GW151226, the effective precession waveform IMRPhenomPv2 gives and the full precession model gives and extends to negative . I panicked a little bit when I first saw this, as GW151226 having a non-zero spin was one of our headline results when first announced. Fortunately, when I worked out the numbers, all our conclusions were safe. The probability of is less than 1%. In fact, we can now say that at least one spin is greater than at 99% probability compared with previously, because the full precession model likes spins in the orbital plane a bit more. Who says data analysis can't be thrilling? Our measurement of tells us about the part of the spins aligned with the orbital angular momentum, but not in the orbital plane. In general, the in-plane components of the spin are only weakly constrained. We basically only get back the information we put in. The leading order effects of in-plane spins is summarised by the effective precession spin parameter . The plot below shows the inferred distributions for . The left half for each event shows our results, the right shows our prior after imposed the constraints on spin we get from . 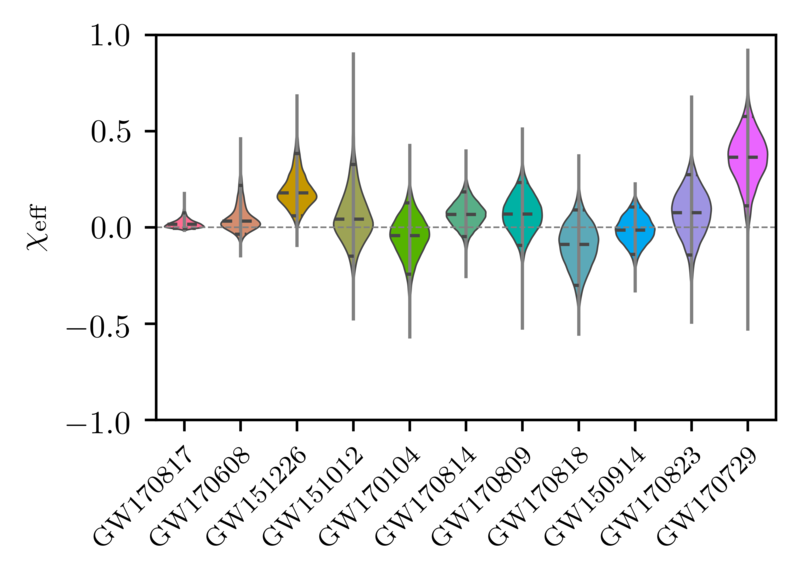 We get the most information for GW151226 and GW170814, but even then it’s not much, and we generally cover the entire allowed range of values. Estimated effective inspiral spin parameters for each of the events in O1 and O2. From lowest chirp mass (left; red) to highest (right; purple): GW170817, GW170608, GW151226, GW151012, GW170104, GW170814, GW170809, GW170818, GW150914, GW170823, GW170729. The left (coloured) part of the plot shows the posterior distribution; the right (white) shows the prior conditioned by the effective inspiral spin parameter constraints. Part of Fig. 5 of the O2 Catalogue Paper. One final measurement which we can make (albeit with considerable uncertainty) is the distance to the source. The distance influences how loud the signal is (the further away, the quieter it is). This also depends upon the inclination of the source (a binary edge-on is quieter than a binary face-on/off). Therefore, the distance is correlated with the inclination and we end up with some butterfly-like plots. GW170729 is again a record setter. It comes from a luminosity distance of away. That means it has travelled across the Universe for – billion years—it potentially started its journey before the Earth formed! Estimated luminosity distances and orbital inclinations for each of the events in O1 and O2. From lowest chirp mass (left; red) to highest (right; purple): GW170817 (solid), GW170608 (dashed), GW151226 (solid), GW151012 (dashed), GW170104 (solid), GW170814 (dashed), GW170809 (dashed), GW170818 (dashed), GW150914 (solid), GW170823 (dashed), GW170729 (solid). The contours mark the 90% credible regions. An inclination of zero means that we’re looking face-on along the direction of the total angular momentum, and inclination of means we’re looking edge-on perpendicular to the angular momentum. Part of Fig. 7 of the O2 Catalogue Paper. To check our results, we reconstruct the waveforms from the data to see that they match our expectations for binary black hole waveforms (and there’s not anything extra there). To do this, we use unmodelled analyses which assume that there is a coherent signal in the detectors: we use both cWB and BayesWave. The results agree pretty well. The reconstructions beautifully match our templates when the signal is loud, but, as you might expect, can resolve the quieter details. You’ll also notice the reconstructions sometimes pick up a bit of background noise away from the signal. This gives you and idea of potential fluctuations. 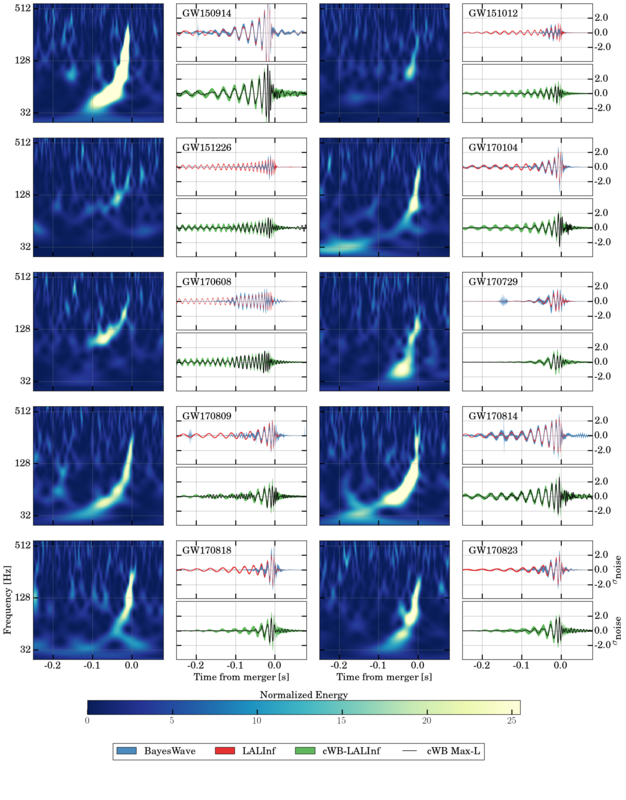 Time–frequency maps and reconstructed signal waveforms for the binary black holes. For each event we show the results from the detector where the signal was loudest. The left panel for each shows the time–frequency spectrogram with the upward-sweeping chip. The right show waveforms: blue the modelled waveforms used to infer parameters (LALInf; top panel); the red wavelet reconstructions (BayesWave; top panel); the black is the maximum-likelihood cWB reconstruction (bottom panel), and the green (bottom panel) shows reconstructions for simulated similar signals. I think the agreement is pretty good! All the data have been whitened as this is how we perform the statistical analysis of our data. Fig. 10 of the O2 Catalogue Paper. I still think GW170814 looks like a slug. Some people think they look like crocodiles. We’ll be doing more tests of the consistency of our signals with general relativity in a future paper. Given all our observations now, we can set better limits on the merger rates. Going from the number of detections seen to the number merger out in the Universe depends upon what you assume about the mass distribution of the sources. Therefore, we make a few different assumptions. For binary black holes, we use (i) a power-law model for the more massive black hole similar to the initial mass function of stars, with a uniform distribution on the mass ratio, and (ii) use uniform-in-logarithmic distribution for both masses. These were designed to bracket the two extremes of potential distributions. With our observations, we’re starting to see that the true distribution is more like the power-law, so I expect we’ll be abandoning these soon. Taking the range of possible values from our calculations, the rate is in the range of – for black holes between and [bonus note]. 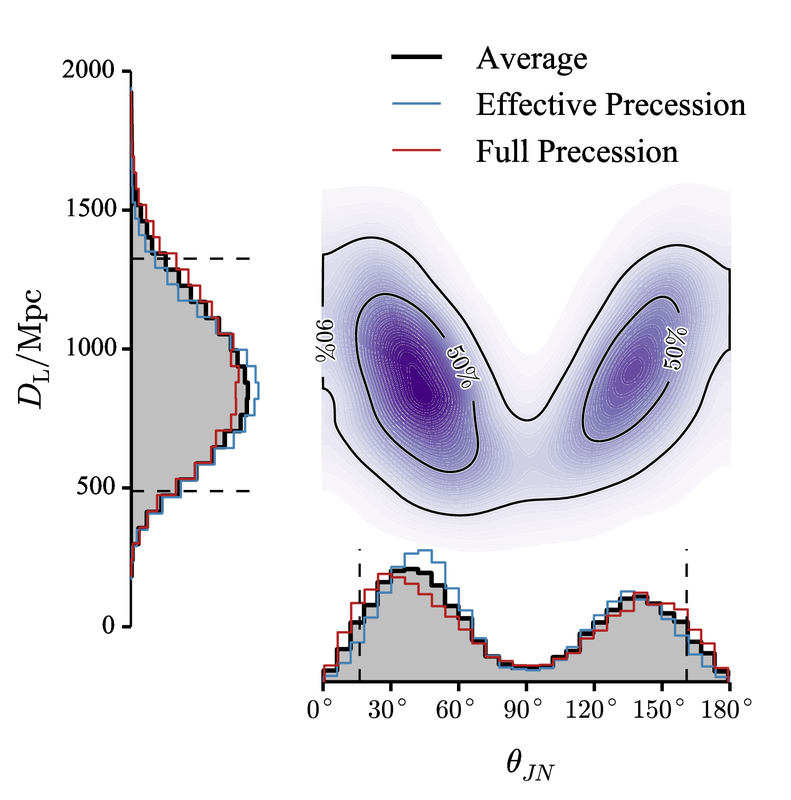 For binary neutron stars, which are perhaps more interesting astronomers, we use a uniform distribution of masses between and , and a Gaussian distribution to match electromagnetic observations. We find that these bracket the range – . This larger than are previous range, as we hadn’t considered the Gaussian distribution previously. 90% upper limits for neutron star–black hole binaries. Three black hole masses were tried and two spin distributions. Results are shown for the two matched-filter search algorithms. Fig. 14 of the O2 Catalogue Paper. Finally, what about neutron star–black holes? Since we don’t have any detections, we can only place an upper limit. This is a maximum of . This is about a factor of 2 better than our O1 results, and is starting to get interesting! We are sure to discover lots more in O3… [bonus note]. Favourite part: A maximum black hole mass? Each detection is exciting. However, we can squeeze even more science out of our observations by looking at the entire population. Using all 10 of our binary black hole observations, we start to trace out the population of binary black holes. Since we still only have 10, we can’t yet be too definite in our conclusions. Our results give us some things to ponder, while we are waiting for the results of O3. I think now is a good time to start making some predictions. We look at the distribution of black hole masses, black hole spins, and the redshift (cosmological time) of the mergers. The black hole masses tell us something about how you go from a massive star to a black hole. The spins tell us something about how the binaries form. The redshift tells us something about how these processes change as the Universe evolves. Ideally, we would look at these all together allowing for mixtures of binary black holes formed through different means. Given that we only have a few observations, we stick to a few simple models. To work out the properties of the population, we perform a hierarchical analysis of our 10 binary black holes. We infer the properties of the individual systems, assuming that they come from a given population, and then see how well that population fits our data compared with a different distribution. In doing this inference, we account for selection effects. Our detectors are not equally sensitive to all sources. For example, nearby sources produce louder signals and we can’t detect signals that are too far away, so if you didn’t account for this you’d conclude that binary black holes only merged in the nearby Universe. Perhaps less obvious is that we are not equally sensitive to all source masses. More massive binaries produce louder signals, so we can detect these further way than lighter binaries (up to the point where these binaries are so high mass that the signals are too low frequency for us to easily spot). This is why we detect more binary black holes than binary neutron stars, even though there are more binary neutron stars out here in the Universe. Model A is a simple power law for the mass of the more massive black hole . There’s no real reason to expect the masses to follow a power law, but the masses of stars when they form do, and astronomers generally like power laws as they’re friendly, so its a sensible thing to try. We fit for the power-law index. The power law goes from a lower limit of to an upper limit which we also fit for. The mass of the lighter black hole is assumed to be uniformly distributed between and the mass of the other black hole. Model B is the same power law, but we also allow the lower mass limit to vary from . We don’t have much sensitivity to low masses, so this lower bound is restricted to be above . I’d be interested in exploring lower masses in the future. Additionally, we allow the mass ratio of the black holes to vary, trying instead of Model A’s . Model C has the same power law, but now with some smoothing at the low-mass end, rather than a sharp turn-on. Additionally, it includes a Gaussian component towards higher masses. This was inspired by the possibility of pulsational pair-instability supernova causing a build up of black holes at certain masses: stars which undergo this lose extra mass, so you’d end up with lower mass black holes than if the stars hadn’t undergone the pulsations. The Gaussian could fit other effects too, for example if there was a secondary formation channel, or just reflect that the pure power law is a bad fit. 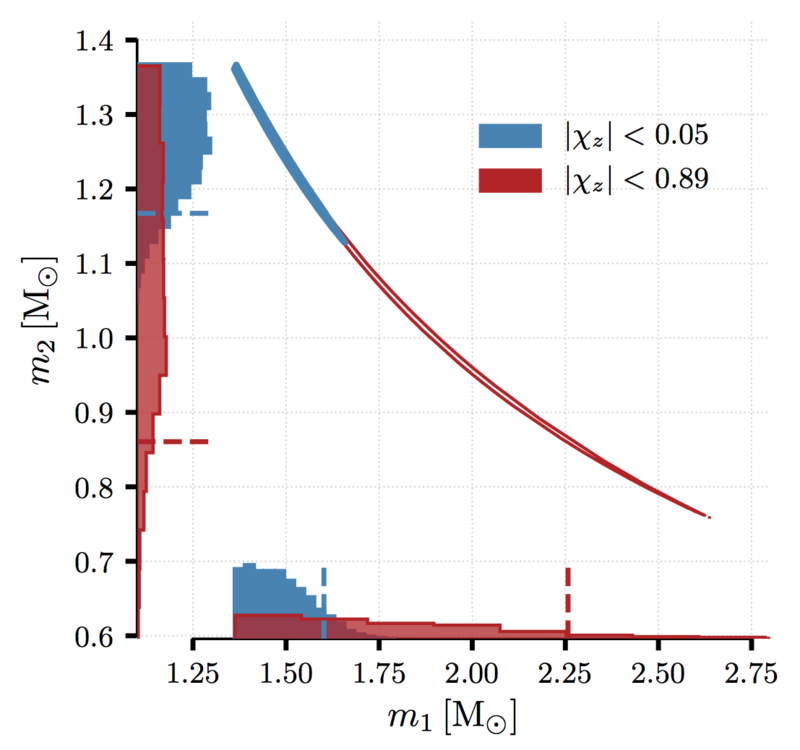 In allowing the mass distributions to vary, we find overall rates which match pretty well those we obtain with our main power-law rates calculation included in the O2 Catalogue Paper, higher than with the main uniform-in-log distribution. The fitted mass distributions are shown in the plot below. 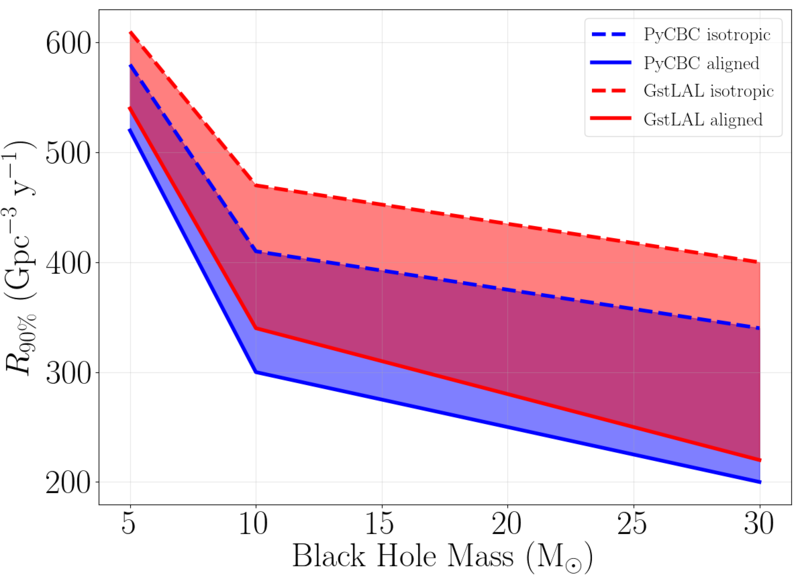 The error bars are pretty broad, but I think the models agree on some broad features: there are more light black holes than heavy black holes; the minimum black hole mass is below about , but we can’t place a lower bound on it; the maximum black hole mass is above about and below about , and we prefer black holes to have more similar masses than different ones. The upper bound on the black hole minimum mass, and the lower bound on the black hole upper mass are set by the smallest and biggest black holes we’ve detected, respectively. Binary black hole merger rate as a function of the primary mass ( ; top) and mass ratio ( ; bottom). The solid line and dark and lighter bands show the median, 50% interval and 90% interval. The dashed line shows the posterior predictive distribution: our expectation for future observations averaging over our uncertainties. Fig. 1 of the O2 Populations Paper. That there does seem to be a drop off at higher masses is interesting. There could be something which stops stars forming black holes in this range. It has been proposed that there is a mass gap due to pair instability supernovae. These explosions completely disrupt their progenitor stars, leaving nothing behind. (I’m not sure if they are accompanied by a flash of green light). You’d expect this to kick for black holes of about – . We infer that 99% of merging black holes have masses below with Model A, with Model B, and with Model C. Therefore, our results are not inconsistent with a mass gap. However, we don’t really have enough evidence to be sure. We can compare how well each of our three models fits the data by looking at their Bayes factors. These naturally incorporate the complexity of the models: models with more parameters (which can be more easily tweaked to match the data) are penalised so that you don’t need to worry about overfitting. We have a preference for Model C. It’s not strong, but I think good evidence that we can’t use a simple power law. For the magnitude, we assume a beta distribution. There’s no reason for this, but these are convenient distributions for things between 0 and 1, which are the limits on black hole spin (0 is nonspinning, 1 is as fast as you can spin). We assume that both spins are drawn from the same distribution. For the spin orientations, we use a mix of an isotropic distribution and a Gaussian centred on being aligned with the orbital angular momentum. You’d expect an isotropic distribution if binaries were assembled dynamically, and perhaps something with spins generally aligned with each other if the binary evolved in isolation. We don’t get any useful information on the mixture fraction. Looking at the spin magnitudes, we have a preference towards smaller spins, but still have support for large spins. The more misaligned spins are, the larger the spin magnitudes can be: for the isotropic distribution, we have support all the way up to maximal values. Inferred spin magnitude distributions. The left shows results for the parametric distribution, assuming a mixture of almost aligned and isotropic spin, with the median (solid), 50% and 90% intervals shaded, and the posterior predictive distribution as the dashed line. The right shows a binned reconstruction of the distribution for aligned and isotropic distributions, showing the median and 90% intervals. Fig. 7 of the O2 Populations Paper. Since spins are harder to measure than masses, it is not surprising that we can’t make strong statements yet. If we were to find something with definitely negative , we would be able to deduce that spins can be seriously misaligned. As a simple model of evolution over cosmological time, we allow the merger rate to evolve as . That’s right, another power law! 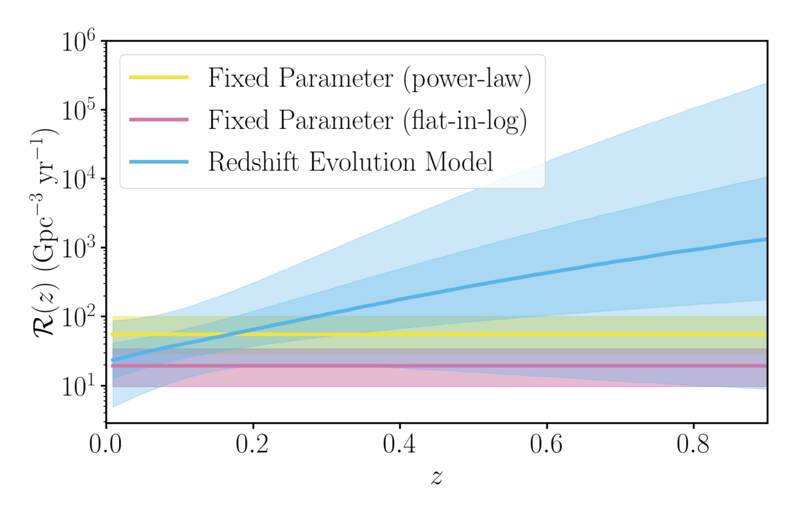 Since we’re only sensitive to relatively small redshifts for the masses we detect ( ), this gives a good approximation to a range of different evolution schemes. 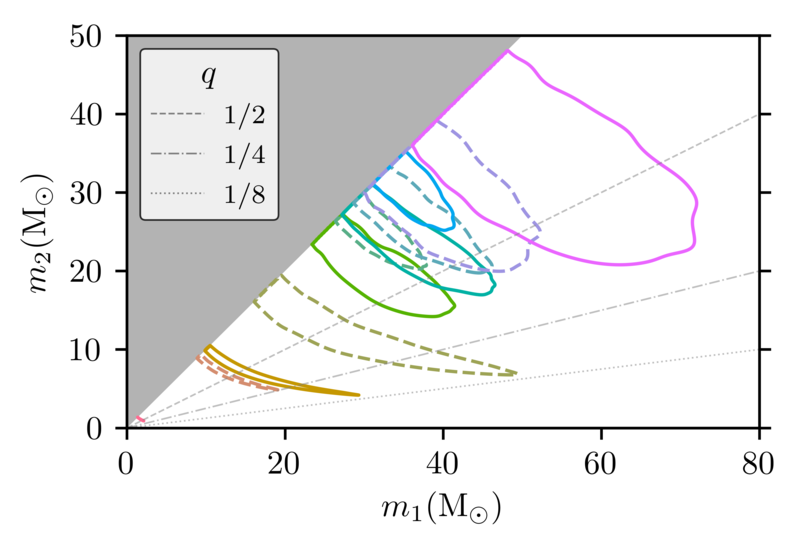 Evolution of the binary black hole merger rate (blue), showing median, 50% and 90% intervals. For comparison, reference non-evolving rates (from the O2 Catalogue Paper) are shown too. Fig. 5 of the O2 Populations Paper. We find that we prefer evolutions that increase with redshift. There’s an 88% probability that , but we’re still consistent with no evolution. We might expect rate to increase as star formation was higher bach towards . If we can measure the time delay between forming stars and black holes merging, we could figure out what happens to these systems in the meantime. The local merger rate is broadly consistent with what we infer with our non-evolving distributions, but is a little on the lower side. Gravitational waves are named as GW-year-month-day, so our first observation from 14 September 2015 is GW150914. We realise that this convention suffers from a Y2K-style bug, but by the time we hit 2100, we’ll have so many detections we’ll need a new scheme anyway. Previously, we had a second designation for less significant potential detections. They were LIGO–Virgo Triggers (LVT), the one example being LVT151012. No-one was really happy with this designation, but it stems from us being cautious with our first announcement, and not wishing to appear over bold with claiming we’d seen two gravitational waves when the second wasn’t that certain. Now we’re a bit more confident, and we’ve decided to simplify naming by labelling everything a GW on the understanding that this now includes more uncertain events. Under the old scheme, GW170729 would have been LVT170729. The idea is that the broader community can decide which events they want to consider as real for their own studies. The current condition for being called a GW is that the probability of it being a real astrophysical signal is at least 50%. Our 11 GWs are safely above that limit. The naming change has hidden the fact that now when we used our improved search pipelines, the significance of GW151012 has increased. It would now be a GW even under the old scheme. 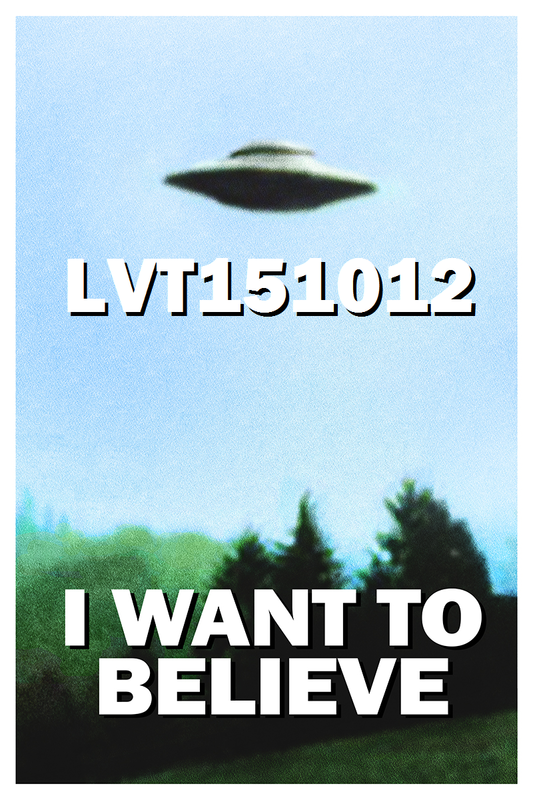 Congratulations LVT151012, I always believed in you! Is it of extraterrestrial origin, or is it just a blurry figure? GW151012: the truth is out there!. We are lacking nicknames for our new events. They came in so fast that we kind of lost track. Ilya Mandel has suggested that GW170729 should be the Tiger, as it happened on the International Tiger Day. Since tigers are the biggest of the big cats, this seems apt. Carl-Johan Haster argues that LIGO+tiger = Liger. Since ligers are even bigger than tigers, this seems like an excellent case to me! I’d vote for calling the bigger of the two progenitor black holes GW170729-tiger, the smaller GW170729-lion, and the final black hole GW17-729-liger. Suggestions for other nicknames are welcome, leave your ideas in the comments. August 2017—Something fishy or just Poisson statistics? The final few weeks of O2 were exhausting. I was trying to write job applications at the time, and each time I sat down to work on my research proposal, my phone went off with another alert. You may be wondering about was special about August. Some have hypothesised that it is because Aaron Zimmerman, my partner for the analysis of GW170104, was on the Parameter Estimation rota to analyse the last few weeks of O2. The legend goes that Aaron is especially lucky as he was bitten by a radioactive Leprechaun. I can neither confirm nor deny this. However, I make a point of playing any lottery numbers suggested by him. A slightly more mundane explanation is that August was when the detectors were running nice and stably. They were observing for a large fraction of the time. LIGO Livingston reached its best sensitivity at this time, although it was less happy for Hanford. We often quantify the sensitivity of our detectors using their binary neutron star range, the average distance they could see a binary neutron star system with a signal-to-noise ratio of 8. If this increases by a factor of 2, you can see twice as far, which means you survey 8 times the volume. This cubed factor means even small improvements can have a big impact. The LIGO Livingston range peak a little over . We’re targeting at least for O3, so August 2017 gives an indication of what you can expect. Binary neutron star range for the instruments across O2. The break around week 3 was for the holidays (We did work Christmas 2015). The break at week 23 was to tune-up the instruments, and clean the mirrors. At week 31 there was an earthquake in Montana, and the Hanford sensitivity didn’t recover by the end of the run. Part of Fig. 1 of the O2 Catalogue Paper. Of course, in the case of GW170817, we just got lucky. 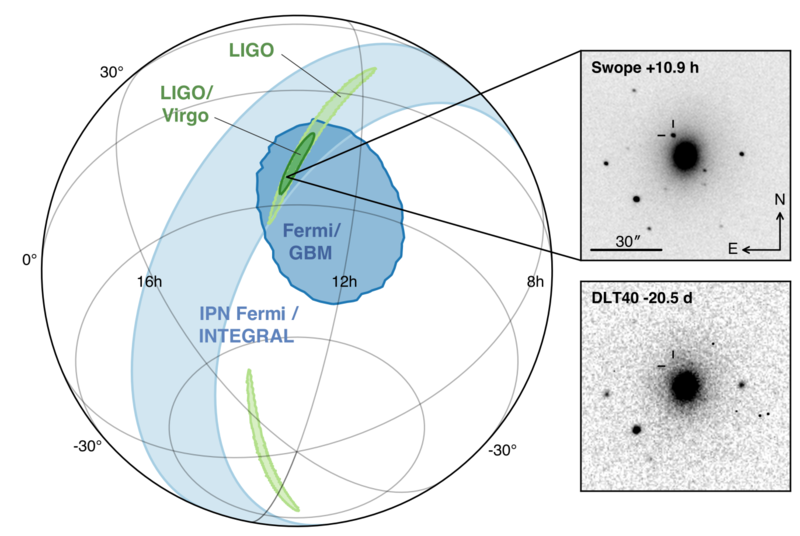 GW170809 was the first event we identified with Virgo after it joined observing. The signal in Virgo is very quiet. We actually got better results when we flipped the sign of the Virgo data. We were just starting to get paranoid when GW170814 came along and showed us that everything was set up right at Virgo. When I get some time, I’d like to investigate how often this type of confusion happens for quiet signals. One of the waveforms, which includes the most complete prescription of the precession of the spins of the black holes, we use in our analysis goes by the technical name of SEOBNRv3. It is extremely computationally expensive. Work has been done to improve that, but this hasn’t been implemented in our reviewed codes yet. We managed to complete an analysis for the GW170104 Discovery Paper, which was a huge effort. I said then to not expect it for all future events. We did it for all the black holes, even for the lowest mass sources which have the longest signals. I was responsible for GW151226 runs (as well as GW170104) and I started these back at the start of the summer. Eve Chase put in a heroic effort to get GW170608 results, we pulled out all the stops for that. I have recently enjoyed my first Thanksgiving in the US. I was lucky enough to be hosted for dinner by Shane Larson and his family (and cats). I ate so much I thought I might collapse to a black hole. Apparently, a Thanksgiving dinner can be 3000–4500 calories. That sounds like a lot, but the merger of GW170729 would have emitted about times more energy. In conclusion, I don’t need to go on a diet. where is the number of detections and is the amount of volume and time we’ve searched. You expect to detect more events if you increase the sensitivity of the detectors (and hence ), or observer for longer (and hence increase ). In our calculation, we included GW170608 in , even though it was found outside of standard observing time. Really, we should increase to factor in the extra time outside of standard observing time when we could have made a detection. This is messy to calculate though, as there’s not really a good way to check this. However, it’s only a small fraction of the time (so the extra should be small), and for much of the sensitivity of the detectors will be poor (so will be small too). Therefore, we estimated any bias from neglecting this is smaller than our uncertainty from the calibration of the detectors, and not worth worrying about. On 14 August 2017 a gravitational wave signal (GW170814), originating from the coalescence of a binary black hole system, was observed by the global gravitational-wave observatory network of the two Advanced LIGO detectors and Advanced Virgo. That’s right, Virgo is in the game! Very few things excite me like unlocking a new character in Smash Bros. A new gravitational wave observatory might come close. Advanced Virgo joined O2, the second observing run of the advanced detector era, on 1 August. This was a huge achievement. It has not been an easy route commissioning the new detector—it never ceases to amaze me how sensitive these machines are. Together, Advanced Virgo (near Pisa) and the two Advanced LIGO detectors (in Livingston and Hanford in the US) would take data until the end of O2 on 25 August. On 14 August, we found a signal. A signal that was observable in all three detectors [bonus note]. Virgo is less sensitive than the LIGO instruments, so there is no impressive plot that shows something clearly popping out, but the Virgo data do complement the LIGO observations, indicating a consistent signal in all three detectors [bonus note]. A cartoon of three different ways to visualise GW170814 in the three detectors. These take a bit of explaining. The top panel shows the signal-to-noise ratio the search template that matched GW170814. They peak at the time corresponding to the merger. The peaks are clear in Hanford and Livingston. The peak in Virgo is less exceptional, but it matches the expected time delay and amplitude for the signal. The middle panels show time–frequency plots. The upward sweeping chirp is visible in Hanford and Livingston, but less so in Virgo as it is less sensitive. The plot is zoomed in so that its possible to pick out the detail in Virgo, but the chirp is visible for a longer stretch of time than plotted in Livingston. The bottom panel shows whitened and band-passed strain data, together with the 90% region of the binary black hole templates used to infer the parameters of the source (the narrow dark band), and an unmodelled, coherent reconstruction of the signal (the wider light band) . The agreement between the templates and the reconstruction is a check that the gravitational waves match our expectations for binary black holes. The whitening of the data mirrors how we do the analysis, by weighting noise at different frequency by an estimate of their typical fluctuations. The signal does certainly look like the inspiral, merger and ringdown of a binary black hole. Figure 1 of the GW170814 Paper. The signal originated from the coalescence of two black holes. GW170814 is thus added to the growing family of GW150914, LVT151012, GW151226 and GW170104. GW170814’s source is another high-mass black hole system. It’s not too surprising (now we know that these systems exist) that we observe lots of these, as more massive black holes produce louder gravitational wave signals. There’s some spread, but the effective inspiral spins are all consistent with being close to zero. Small values occur when the individual spins are small, if the spins are misaligned with each other, or some combination of the two. I’m starting to ponder if high-mass black holes might have small spins. We don’t have enough information to tease these apart yet, but this new system is consistent with the story so far. One of the things Virgo helps a lot with is localizing the source on the sky. Most of the information about the source location comes from the difference in arrival times at the detectors (since we know that gravitational waves should travel at the speed of light). With two detectors, the time delay constrains the source to a ring on the sky; with three detectors, time delays can narrow the possible locations down to a couple of blobs. Folding in the amplitude of the signal as measured by the different detectors adds extra information, since detectors are not equally sensitive to all points on the sky (they are most sensitive to sources over head or underneath). This can even help when you don’t observe the signal in all detectors, as you know the source must be in a direction that detector isn’t too sensitive too. 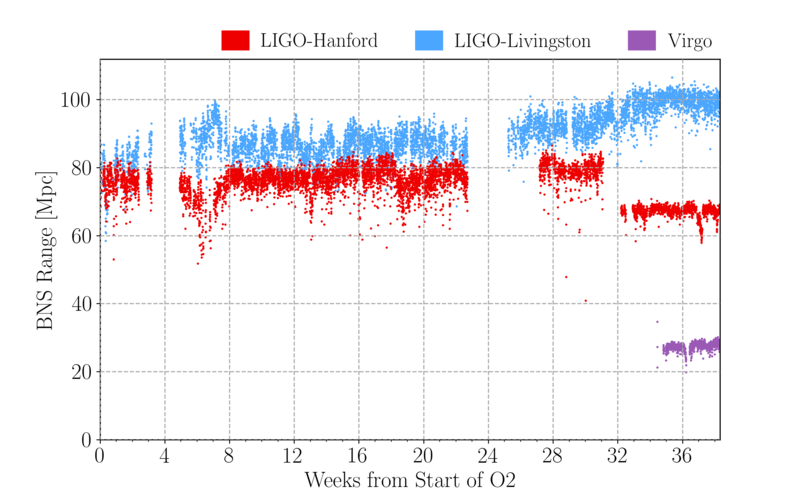 GW170814 arrived at LIGO Livingston first (although it’s not a competition), then ~8 ms later at LIGO Hanford, and finally ~14 ms later at Virgo. If we only had the two LIGO detectors, we’d have an uncertainty on the source’s sky position of over 1000 square degrees, but adding in Virgo, we get this down to 60 square degrees. That’s still pretty large by astronomical standards (the full Moon is about a quarter of a square degree), but a fantastic improvement [bonus note]! 90% probability localizations for GW170814. The large banana shaped (and banana coloured, but not banana flavoured) curve uses just the two LIGO detectors, the area is 1160 square degrees. The green shows the improvement adding Virgo, the area is just 100 square degrees. Both of these are calculated using BAYESTAR, a rapid localization algorithm. The purple map is the final localization from our full parameter estimation analysis (LALInference), its area is just 60 square degrees! Whereas BAYESTAR only uses the best matching template from the search, the full parameter estimation analysis is free to explore a range of different templates. 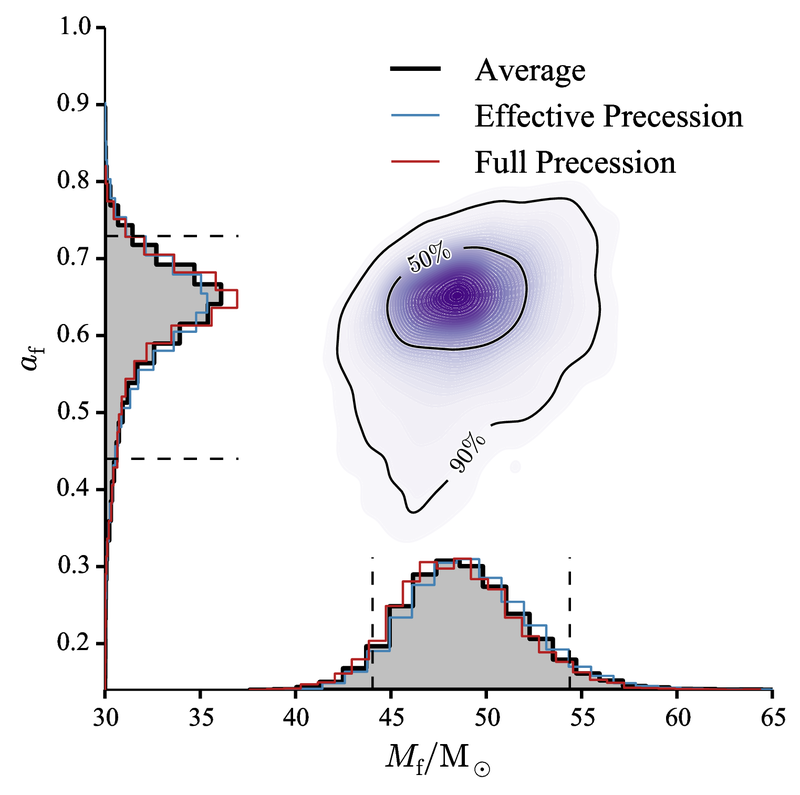 Part of Figure 3 of the GW170814 Paper. Having additional detectors can help improve gravitational wave measurements in other ways too. One of the predictions of general relativity is that gravitational waves come in two polarizations. These polarizations describe the pattern of stretching and squashing as the wave passes, and are illustrated below. The two polarizations of gravitational waves: plus (left) and cross (right). Here, the wave is travelling into or out of the screen. Animations adapted from those by MOBle on Wikipedia. These two polarizations are the two tensor polarizations, but other patterns of squeezing could be present in modified theories of gravity. If we could detect any of these we would immediately know that general relativity is wrong. The two LIGO detectors are almost exactly aligned, so its difficult to get any information on other polarizations. (We tried with GW150914 and couldn’t say anything either way). With Virgo, we get a little more information. As a first illustration of what we may be able to do, we compared how well the observed pattern of radiation at the detectors matched different polarizations, to see how general relativity’s tensor polarizations compared to a signal of entirely vector or scalar radiation. The tensor polarizations are clearly preferred, so general relativity lives another day. This isn’t too surprising, as most modified theories of gravity with other polarizations predict mixtures of the different polarizations (rather than all of one). To be able to constrain all the mixtures with these short signals we really need a network of five detectors, so we’ll have to wait for KAGRA and LIGO-India to come on-line. The six polarizations of a metric theory of gravity. The wave is travelling in the direction. (a) and (b) are the plus and cross tensor polarizations of general relativity. (c) and (d) are the scalar breathing and longitudinal modes, and (e) and (f) are the vector and polarizations. The tensor polarizations (in red) are transverse, the vector and longitudinal scalar mode (in green) are longitudinal. The scalar breathing mode (in blue) is an isotropic expansion and contraction, so its a bit of a mix of transverse and longitudinal. Figure 10 from (the excellent) Will (2014). We’ll be presenting a more detailed analysis of GW170814 later, in papers summarising our O2 results, so stay tuned for more. If you’re looking for the most up-to-date results regarding GW170814, check out the O2 Catalogue Paper. Those of you who have been following the story of gravitational waves for a while may remember the case of the Big Dog. This was a blind injection of a signal during the initial detector era. One of the things that made it an interesting signal to analyse, was that it had been injected with an inconsistent sign in Virgo compared to the two LIGO instruments (basically it was upside down). Making this type of sign error is easy, and we were a little worried that we might make this sort of mistake when analysing the real data. The Virgo calibration team were extremely careful about this, and confident in their results. Of course, we’re quite paranoid, so during the preliminary analysis of GW170814, we tried some parameter estimation runs with the data from Virgo flipped. This was clearly disfavoured compared to the right sign, so we all breathed easily. I am starting to believe that God may be a detector commissioner. At the start of O1, we didn’t have the hardware injection systems operational, but GW150914 showed that things were working properly. Now, with a third detector on-line, GW170814 shows that the network is functioning properly. Astrophysical injections are definitely the best way to confirm things are working! Our usual way to search for binary black hole signals is compare the data to a bank of waveform templates. Since Virgo is less sensitive the the two LIGO detectors, and would only be running for a short amount of time, these main searches weren’t extended to use data from all three detectors. This seemed like a sensible plan, we were confident that this wouldn’t cause us to miss anything, and we can detect GW170814 with high significance using just data from Livingston and Hanford—the false alarm rate is estimated to be less than 1 in 27000 years (meaning that if the detectors were left running in the same state, we’d expect random noise to make something this signal-like less than once every 27000 years). However, we realised that we wanted to be able to show that Virgo had indeed seen something, and the search wasn’t set up for this. Therefore, for the paper, we list three different checks to show that Virgo did indeed see the signal. In a similar spirit to the main searches, we took the best fitting template (it doesn’t matter in terms of results if this is the best matching template found by the search algorithms, or the maximum likelihood waveform from parameter estimation), and compared this to a stretch of data. We then calculated the probability of seeing a peak in the signal-to-noise ratio (as shown in the top row of Figure 1) at least as large as identified for GW170814, within the time window expected for a real signal. Little blips of noise can cause peaks in the signal-to-noise ratio, for example, there’s a glitch about 50 ms after GW170814 which shows up. We find that there’s a 0.3% probability of getting a signal-to-ratio peak as large as GW170814. That’s pretty solid evidence for Virgo having seen the signal, but perhaps not overwhelming. Binary black hole coalescences can also be detected (if the signals are short) by our searches for unmodelled signals. This was the case for GW170814. These searches were using data from all three detectors, so we can compare results with and without Virgo. Using just the two LIGO detectors, we calculate a false alarm rate of 1 per 300 years. This is good enough to claim a detection. Adding in Virgo, the false alarm rate drops to 1 per 5900 years! We see adding in Virgo improves the significance by almost a factor of 20. Using our parameter estimation analysis, we calculate the evidence (marginal likelihood) for (i) there being a coherent signal in Livingston and Hanford, and Gaussian noise in Virgo, and (ii) there being a coherent signal in all three detectors. We then take the ratio to calculate the Bayes factor. We find that a coherent signal in all three detectors is preferred by a factor of over 1600. This is a variant of a test proposed in Veitch & Vecchio (2010); it could be fooled if the noise in Virgo is non-Gaussian (if there is a glitch), but together with the above we think that the simplest explanation for Virgo’s data is that there is a signal. In conclusion: Virgo works. Probably. Adding Virgo to the network greatly improves localization of the source, which is a huge advantage when searching for counterparts. For a binary black hole, as we have here, we don’t expect a counterpart (which would make finding one even more exciting). So far, no counterpart has been reported. Arcavi et al. (2017) reported an optical search from the Las Cumbres Observatory. Smith et al. (2018) reported an optical search, targeting strong-lensing galaxy clusters, with Gemini South and the Very Large Telescope. Adriani et al. (2018) describe their gamma-ray observations with CALET and report upper limits for GW151226, GW170104, GW170608, GW170814 and GW170817. Doctor et al. (2018) performed a pretty comprehensive optical search with the Dark Energy Camera. Yang et al. (2019) describes an optical search from DLT40. This paper covers the whole of O2 including GW170104, GW170608, GW170814, GW170817 plus GW170809 and GW170823. This is the first observation we’ve announced before being published. The draft made public at time at announcement was accepted, pending fixing up some minor points raised by the referees (who were fantastically quick in reporting back). I guess that binary black holes are now familiar enough that we are on solid ground claiming them. I’d be interested to know if people think that it would be good if we didn’t always wait for the rubber stamp of peer review, or whether they would prefer to for detections to be externally vetted? Sharing papers before publication would mean that we get more chance for feedback from the community, which is would be good, but perhaps the Collaboration should be seen to do things properly? One reason that the draft paper is being shared early is because of an opportunity to present to the G7 Science Ministers Meeting in Italy. I think any excuse to remind politicians that international collaboration is a good thing™ is worth taking. Although I would have liked the paper to be a little more polished [bonus advice]. The opportunity to present here only popped up recently, which is one reason why things aren’t as perfect as usual. I also suspect that Virgo were keen to demonstrate that they had detected something prior to any Nobel Prize announcement. There’s a big difference between stories being written about LIGO and Virgo’s discoveries, and having as an afterthought that Virgo also ran in August. The main reason, however, was to get this paper out before the announcement of GW170817. The identification of GW170817’s counterpart relied on us being able to localize the source. In that case, there wasn’t a clear signal in Virgo (the lack of a signal tells us the source wan’t in a direction wasn’t particularly sensitive to). People agreed that we really need to demonstrate that Virgo can detect gravitational waves in order to be convincing that not seeing a signal is useful information. We needed to demonstrate that Virgo does work so that our case for GW170817 was watertight and bulletproof (it’s important to be prepared). One point I was hoping that the Paper Writing Team would clarify is our choice of prior probability distribution for the black hole spins. We don’t get a lot of information about the spins from the signal, so our choice of prior has an impact on the results. The paper says that we assume “no restrictions on the spin orientations”, which doesn’t make much sense, as one of the two waveforms we use to analyse the signal only includes spins aligned with the orbital angular momentum! What the paper meant was that we assume a prior distribution which has an isotopic distribution of spins, and for the aligned spin (no precession) waveform, we assume a prior probability distribution on the aligned components of the spins which matches what you would have for an isotropic distribution of spins (in effect, assuming that we can only measure the aligned components of the spins, which is a good approximation). 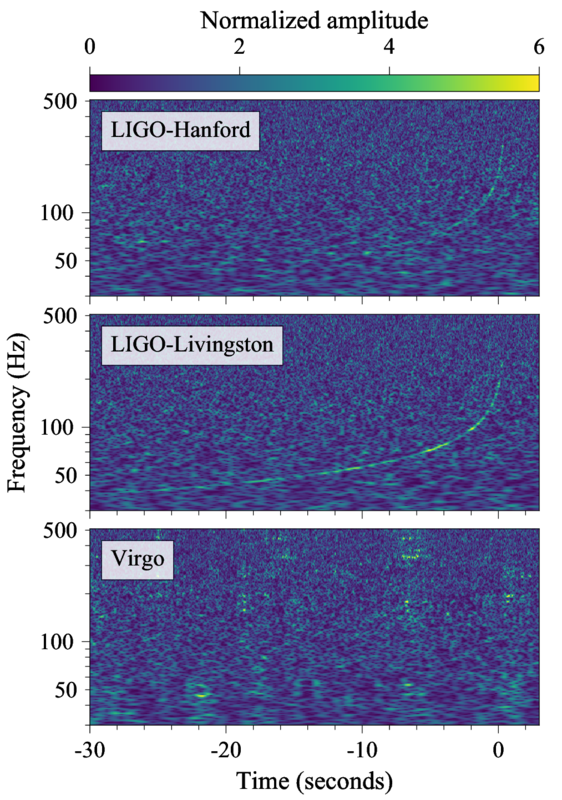 On 4 January 2017, Advanced LIGO made a new detection of gravitational waves. The signal, which we call GW170104 [bonus note], came from the coalescence of two black holes, which inspiralled together (making that characteristic chirp) and then merged to form a single black hole. On 4 January 2017, I was just getting up off the sofa when my phone buzzed. My new year’s resolution was to go for a walk every day, and I wanted to make use of the little available sunlight. However, my phone informed me that PyCBC (one or our search algorithms for signals from coalescing binaries) had identified an interesting event. I sat back down. I was on the rota to analyse interesting signals to infer their properties, and I was pretty sure that people would be eager to see results. They were. I didn’t leave the sofa for the rest of the day, bringing my new year’s resolution to a premature end. Since 4 January, my time has been dominated by working on GW170104 (you might have noticed a lack of blog posts). Below I’ll share some of my war stories from life on the front line of gravitational-wave astronomy, and then go through some of the science we’ve learnt. (Feel free to skip straight to the science, recounting the story was more therapy for me). 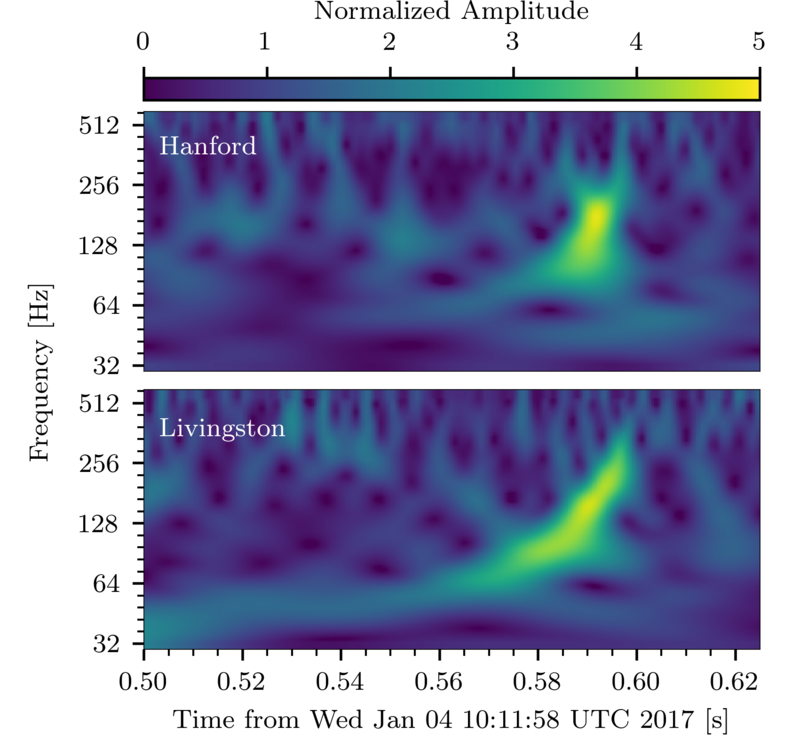 Time–frequency plots for GW170104 as measured by Hanford (top) and Livingston (bottom). The signal is clearly visible as the upward sweeping chirp. The loudest frequency is something between E3 and G♯3 on a piano, and it tails off somewhere between D♯4/E♭4 and F♯4/G♭4. Part of Fig. 1 of the GW170104 Discovery Paper. In the second observing run, the Parameter Estimation group have divided up responsibility for analysing signals into two week shifts. For each rota shift, there is an expert and a rookie. I had assumed that the first slot of 2017 would be a quiet time. The detectors were offline over the holidays, due back online on 4 January, but the instrumentalists would probably find some extra tinkering they’d want to do, so it’d probably slip a day, and then the weather would be bad, so we’d probably not collect much data anyway… I was wrong. Very wrong. The detectors came back online on time, and there was a beautifully clean detection on day one. My partner for the rota was Aaron Zimmerman. 4 January was his first day running parameter estimation on live signals. I think I would’ve run and hidden underneath my duvet in his case (I almost did anyway, and I lived through the madness of our first detection GW150914), but he rose to the occasion. We had first results after just a few hours, and managed to send out a preliminary sky localization to our astronomer partners on 6 January. I think this was especially impressive as there were some difficulties with the initial calibration of the data. This isn’t a problem for the detection pipelines, but does impact the parameters which we infer, particularly the sky location. The Calibration group worked quickly, and produced two updates to the calibration. We therefore had three different sets of results (one per calibration) by 6 January [bonus note]! Producing the final results for the paper was slightly more relaxed. Aaron and I conscripted volunteers to help run all the various permutations of the analysis we wanted to double-check our results [bonus note]. Recovered gravitational waveforms from analysis of GW170104. The broader orange band shows our estimate for the waveform without assuming a particular source (wavelet). 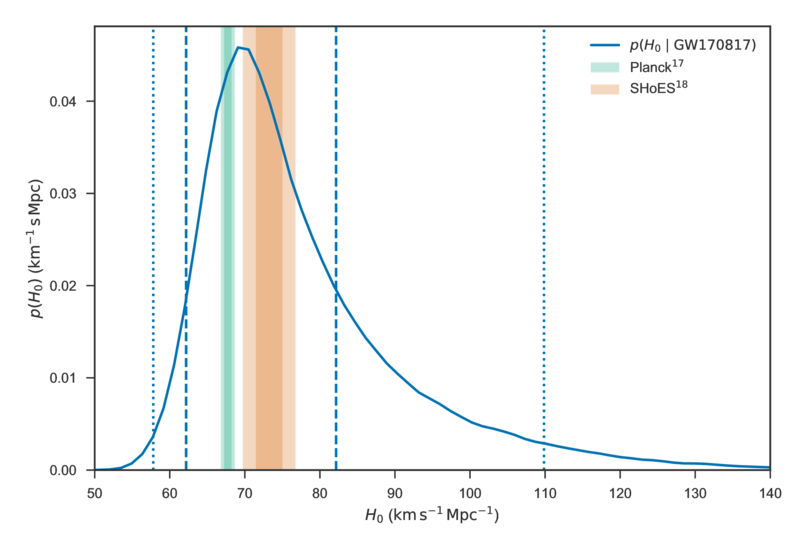 The narrow blue bands show results if we assume it is a binary black hole (BBH) as predicted by general relativity. The two match nicely, showing no evidence for any extra features not included in the binary black hole models. Figure 4 of the GW170104 Discovery Paper. I started working on GW170104 through my parameter estimation duties, and continued with paper writing. Being on the paper writing team has given me huge respect for the teams who led the GW150914 and GW151226 papers. It is undoubtedly one of the most difficult things I’ve ever done. It is extremely hard to absorb negative remarks about your work continuously for months [bonus note]—of course people don’t normally send comments about things that they like, but that doesn’t cheer you up when you’re staring at an inbox full of problems that need fixing. Getting a collaboration of 1000 people to agree on a paper is like herding cats while being a small duckling. On of the first challenges for the paper writing team was deciding what was interesting about GW170104. It was another binary black hole coalescence—aren’t people getting bored of them by now? The signal was quieter than GW150914, so it wasn’t as remarkable. However, its properties were broadly similar. It was suggested that perhaps we should title the paper “GW170104: The most boring gravitational-wave detection”. One potentially interesting aspect was that GW170104 probably comes from greater distance than GW150914 or GW151226 (but perhaps not LVT151012) [bonus note]. This might make it a good candidate for testing for dispersion of gravitational waves. Dispersion occurs when different frequencies of gravitational waves travel at different speeds. A similar thing happens for light when travelling through some materials, which leads to prisms splitting light into a spectrum (and hence the creation of Pink Floyd album covers). Gravitational waves don’t suffered dispersion in general relativity, but do in some modified theories of gravity. It should be easier to spot dispersion in signals which have travelled a greater distance, as the different frequencies have had more time to separate out. Hence, GW170104 looks pretty exciting. However, being further away also makes the signal quieter, and so there is more uncertainty in measurements and it is more difficult to tell if there is any dispersion. Dispersion is also easier to spot if you have a larger spread of frequencies, as then there can be more spreading between the highest and lowest frequencies. When you throw distance, loudness and frequency range into the mix, GW170104 doesn’t always come out on top, depending upon the particular model for dispersion: sometimes GW150914’s loudness wins, other times GW151226’s broader frequency range wins. GW170104 isn’t too special here either. Even though GW170104 didn’t look too exciting, we started work on a paper, thinking that we would just have a short letter describing our observations. The Compact Binary Coalescence group decided that we only wanted a single paper, and we wouldn’t bother with companion papers as we did for GW150914. As we started work, and dug further into our results, we realised that actually there was rather a lot that we could say. I guess the moral of the story is that even though you might be overshadowed by the achievements of your siblings, it doesn’t mean that you’re not awesome. There might not be one outstanding feature of GW170104, but there are lots of little things that make it interesting. We are still at the beginning of understanding the properties of binary black holes, and each new detection adds a little more to our picture. I think GW170104 is rather neat, and I hope you do too. As we delved into the details of our results, we realised there was actually a lot of things that we could say about GW170104, especially when considered with our previous observations. We ended up having to move some of the technical details and results to Supplemental Material. With hindsight, perhaps it would have been better to have a companion paper or two. However, I rather like how packed with science this paper is. The paper, which Physical Review Letters have kindly accommodated, despite its length, might not be as polished a classic as the GW150914 Discovery Paper, but I think they are trying to do different things. I rarely ever refer to the GW150914 Discovery Paper for results (more commonly I use it for references), whereas I think I’ll open up the GW170104 Discovery Paper frequently to look up numbers. Success! The view across Lac d’Annecy. Taken on a stroll after the Gravitational Wave Physics and Astronomy Workshop, the weekend following the publication of the paper. Advanced LIGO’s first observing run was hugely successful. Running from 12 September 2015 until 19 January 2016, there were two clear gravitational-wave detections, GW1501914 and GW151226, as well as a less certain candidate signal LVT151012. All three (assuming that they are astrophysical signals) correspond to the coalescence of binary black holes. The second observing run started 30 November 2016. Following the first observing run’s detections, we expected more binary black hole detections. 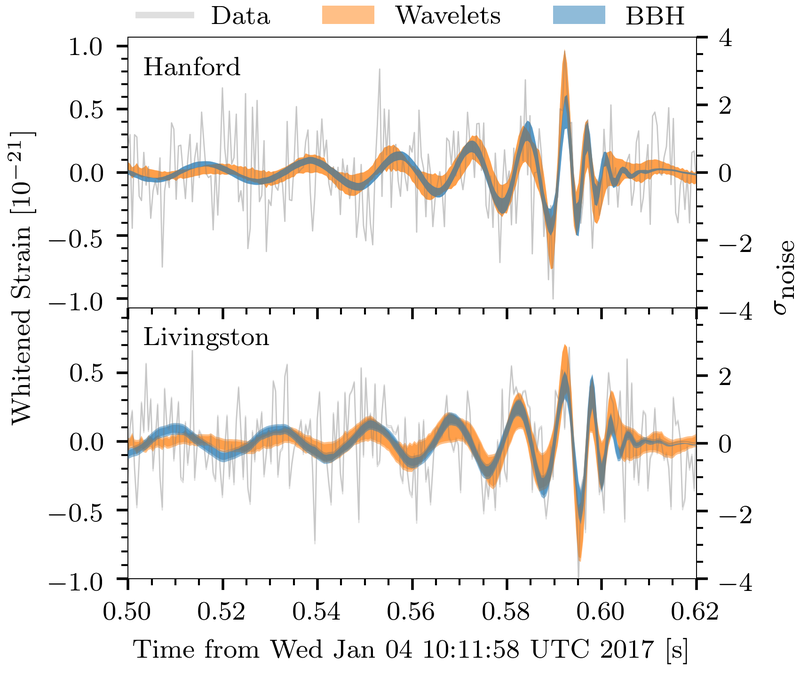 On 4 January, after we had collected almost 6 days’ worth of coincident data from the two LIGO instruments [bonus note], there was a detection. The signal was first spotted by an online analysis. Our offline analysis of the data (using refined calibration and extra information about data quality) showed that the signal, GW170104, is highly significant. For both GstLAL and PyCBC, search algorithms which use templates to search for binary signals, the false alarm rate is estimated to be about 1 per 70,000 years. The signal is also found in unmodelled (burst) searches, which look for generic, short gravitational wave signals. Since these are looking for more general signals than just binary coalescences, the significance associated with GW170104 isn’t as great, and coherent WaveBurst estimates a false alarm rate of 1 per 20,000 years. This is still pretty good! Reconstructions of the waveform from unmodelled analyses also match the form expected for binary black hole signals. 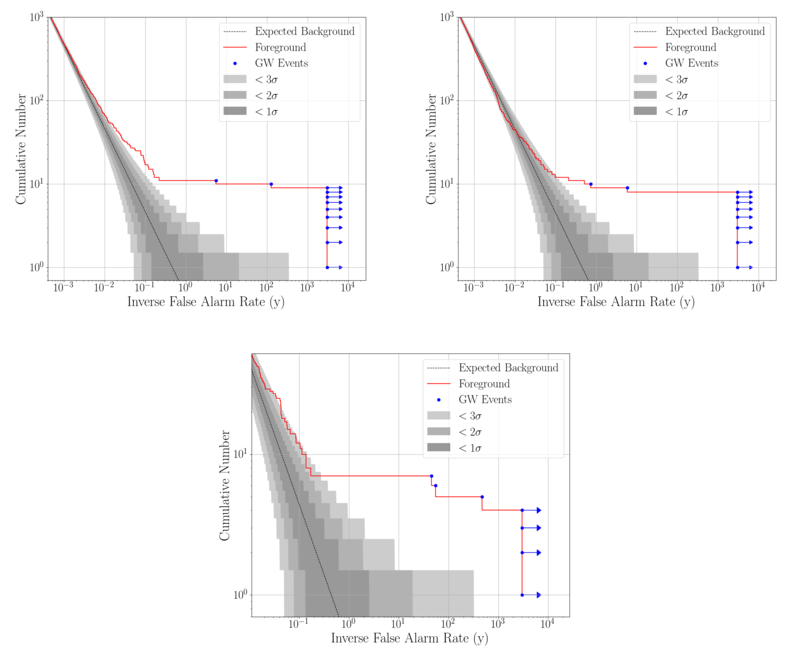 The search false alarm rates are the rate at which you’d expect something this signal-like (or more signal-like) due to random chance, if you data only contained noise and no signals. Using our knowledge of the search pipelines, and folding in some assumptions about the properties of binary black holes, we can calculate a probability that GW170104 is a real astrophysical signal. This comes out to be greater than . As for the previous gravitational wave detections, GW170104 comes from a binary black hole coalescence. The initial black holes were and (where is the mass of our Sun), and the final black hole was . The quoted values are the median values and the error bars denote the central 90% probable range. The plot below shows the probability distribution for the masses; GW170104 neatly nestles in amongst the other events. Estimated masses for the two black holes in the binary . The two-dimensional shows the probability distribution for GW170104 as well as 50% and 90% contours for all events. The one-dimensional plot shows results using different waveform models. The dotted lines mark the edge of our 90% probability intervals. Figure 2 of the GW170104 Discovery Paper. GW150914 was the first time that we had observed stellar-mass black holes with masses greater than around . GW170104 has similar masses, showing that our first detection was not a fluke, but there really is a population of black holes with masses stretching up into this range. Black holes have two important properties: mass and spin. We have good measurements on the masses of the two initial black holes, but not the spins. The sensitivity of the form of the gravitational wave to spins can be described by two effective spin parameters, which are mass-weighted combinations of the individual spins. The effective inspiral spin parameter qualifies the impact of the spins on the rate of inspiral, and where the binary plunges together to merge. It ranges from +1, meaning both black holes are spinning as fast as possible and rotate in the same direction as the orbital motion, to −1, both black holes spinning as fast as possible but in the opposite direction to the way that the binary is orbiting. A value of 0 for could mean that the black holes are not spinning, that their rotation axes are in the orbital plane (instead of aligned with the orbital angular momentum), or that one black hole is aligned with the orbital motion and the other is antialigned, so that their effects cancel out. The effective precession spin parameter qualifies the amount of precession, the way that the orbital plane and black hole spins wobble when they are not aligned. It is 0 for no precession, and 1 for maximal precession. We can place some constraints on , but can say nothing about . The inferred value of the effective inspiral spin parameter is . 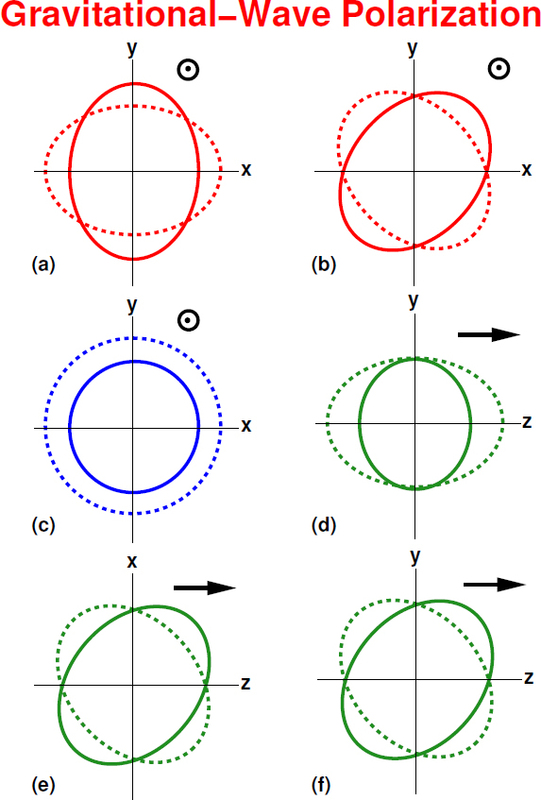 Therefore, we disfavour large spins aligned with the orbital angular momentum, but are consistent with small aligned spins, misaligned spins, or spins antialigned with the angular momentum. The value is similar to that for GW150914, which also had a near-zero, but slightly negative of . Estimated effective inspiral spin parameter and effective precession spin parameter. The two-dimensional shows the probability distribution for GW170104 as well as 50% and 90% contours. The one-dimensional plot shows results using different waveform models, as well as the prior probability distribution. The dotted lines mark the edge of our 90% probability intervals. We learn basically nothing about precession. Part of Figure 3 of the GW170104 Discovery Paper. Converting the information about , the lack of information about , and our measurement of the ratio of the two black hole masses, into probability distributions for the component spins gives the plots below [bonus note]. We disfavour (but don’t exclude) spins aligned with the orbital angular momentum, but can’t say much else. Estimated orientation and magnitude of the two component spins. The distribution for the more massive black hole is on the left, and for the smaller black hole on the right. The probability is binned into areas which have uniform prior probabilities, so if we had learnt nothing, the plot would be uniform. Part of Figure 3 of the GW170104 Discovery Paper. One of the comments we had on a draft of the paper was that we weren’t making any definite statements about the spins—we would have if we could, but we can’t for GW170104, at least for the spins of the two inspiralling black holes. We can be more definite about the spin of the final black hole. If two similar mass black holes spiral together, the angular momentum from the orbit is enough to give a spin of around . The spins of the component black holes are less significant, and can make it a bit higher of lower. We infer a final spin of ; there is a tail of lower spin values on account of the possibility that the two component black holes could be roughly antialigned with the orbital angular momentum. Estimated mass and spin for the final black hole. The two-dimensional shows the probability distribution for GW170104 as well as 50% and 90% contours. The one-dimensional plot shows results using different waveform models. The dotted lines mark the edge of our 90% probability intervals. Figure 6 of the GW170104 Supplemental Material (Figure 11 of the arXiv version). If you’re interested in parameter describing GW170104, make sure to check out the big table in the Supplemental Material. I am a fan of tables [bonus note]. Adding the first 11 days of coincident data from the second observing run (including the detection of GW170104) to the results from the first observing run, we find merger rates consistent with those from the first observing run. To calculate the merger rates, we need to assume a distribution of black hole masses, and we use two simple models. One uses a power law distribution for the primary (larger) black hole and a uniform distribution for the mass ratio; the other uses a distribution uniform in the logarithm of the masses (both primary and secondary). The true distribution should lie somewhere between the two. The power law rate density has been updated from to , and the uniform in log rate density goes from to . The median values stay about the same, but the additional data have shrunk the uncertainties a little. The discoveries from the first observing run showed that binary black holes exist and merge. The question is now how exactly they form? There are several suggested channels, and it could be there is actually a mixture of different formation mechanisms in action. It will probably require a large number of detections before we can make confident statements about the the probable formation mechanisms; GW170104 is another step towards that goal. Isolated binary evolution, where a binary star system lives its life together with both stars collapsing to black holes at the end. To get the black holes close enough to merge, it is usually assumed that the stars go through a common envelope phase, where one star puffs up so that the gravity of its companion can steal enough material that they lie in a shared envelope. The drag from orbiting inside this then shrinks the orbit. Dynamical evolution where black holes form in dense clusters and a binary is created by dynamical interactions between black holes (or stars) which get close enough to each other. It’s a little artificial to separate the two, as there’s not really such a thing as an isolated binary: most stars form in clusters, even if they’re not particularly large. There are a variety of different modifications to the two main channels, such as having a third companion which drives the inner binary to merge, embedding the binary is a dense disc (as found in galactic centres), or dynamically assembling primordial black holes (formed by density perturbations in the early universe) instead of black holes formed through stellar collapse. All the channels can predict black holes around the masses of GW170104 (which is not surprising given that they are similar to the masses of GW150914). The updated rates are broadly consistent with most channels too. The tightening of the uncertainty of the rates means that the lower bound is now a little higher. This means some of the channels are now in tension with the inferred rates. Some of the more exotic channels—requiring a third companion (Silsbee & Tremain 2017; Antonini, Toonen & Hamers 2017) or embedded in a dense disc (Bartos et al. 2016; Stone, Metzger & Haiman 2016; Antonini & Rasio 2016)—can’t explain the full rate, but I don’t think it was ever expected that they could, they are bonus formation mechanisms. 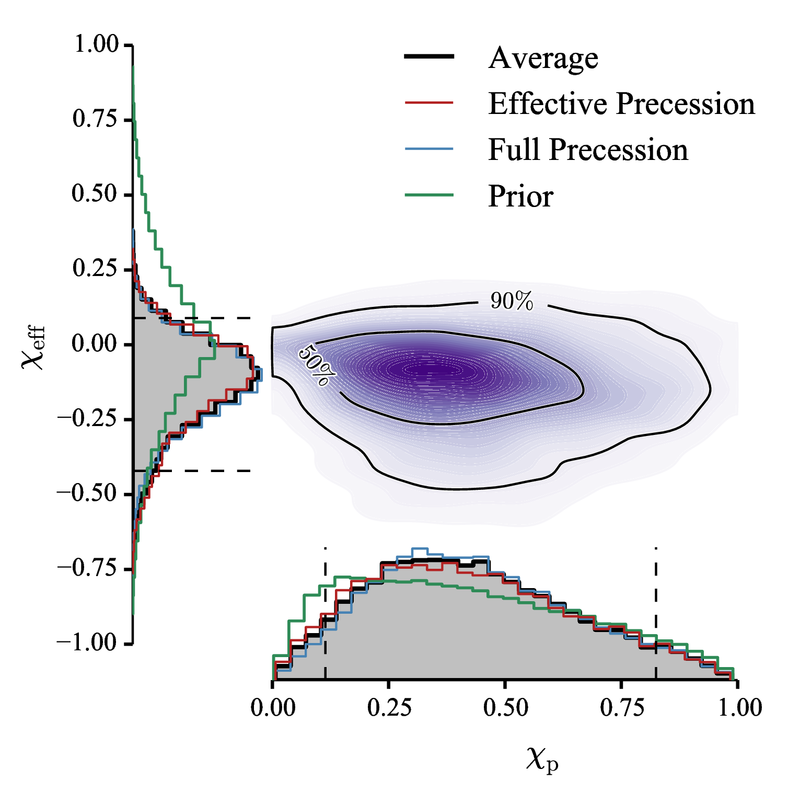 However, some of the dynamical models are also now looking like they could predict a rate that is a bit low (Rodriguez et al. 2016; Mapelli 2016; Askar et al. 2017; Park et al. 2017). Assuming that this result holds, I think this may mean that some of the model parameters need tweaking (there are more optimistic predictions for the merger rates from clusters which are still perfectly consistent), that this channel doesn’t contribute all the merging binaries, or both. The spins might help us understand formation mechanisms. Traditionally, it has been assumed that isolated binary evolution gives spins aligned with the orbital angular momentum. The progenitor stars were probably more or less aligned with the orbital angular momentum, and tides, mass transfer and drag from the common envelope would serve to realign spins if they became misaligned. Rodriguez et al. (2016) gives a great discussion of this. Dynamically formed binaries have no correlation between spin directions, and so we would expect an isotropic distribution of spins. Hence it sounds quite simple: misaligned spins indicates dynamical formation (although we can’t tell if the black holes are primordial or stellar), and aligned spins indicates isolated binary evolution. The difficulty is the traditional assumption for isolated binary evolution potentially ignores a number of effects which could be important. When a star collapses down to a black hole, there may be a supernova explosion. There is an explosion of matter and neutrinos and these can give the black hole a kick. The kick could change the orbital plane, and so misalign the spin. Even if the kick is not that big, if it is off-centre, it could torque the black hole, causing it to rotate and so misalign the spin that way. There is some evidence that this can happen with neutron stars, as one of the pulsars in the double pulsar system shows signs of this. There could also be some instability that changes the angular momentum during the collapse of the star, possibly with different layers rotating in different ways [bonus note]. The spin of the black hole would then depend on how many layers get swallowed. This is an area of research that needs to be investigated further, and I hope the prospect of gravitational wave measurements spurs this on. For GW170104, we know the spins are not large and aligned with the orbital angular momentum. This might argue against one variation of isolated binary evolution, chemically homogeneous evolution, where the progenitor stars are tidally locked (and so rotate aligned with the orbital angular momentum and each other). Since the stars are rapidly spinning and aligned, you would expect the final black holes to be too, if the stars completely collapse down as is usually assumed. If the stars don’t completely collapse down though, it might still be possible that GW170104 fits with this model. Aside from this, GW170104 is consistent with all the other channels. Estimated effective inspiral spin parameter for all events. To indicate how much (or little) we’ve learnt, the prior probability distribution for GW170104 is shown (the other priors are similar).All of the events have at 90% probability. Figure 5 of the GW170104 Supplemental Material (Figure 10 of the arXiv version). This is one of my favourite plots [bonus note]. If we start looking at the population of events, we do start to notice something about the spins. All of the inferred values of are close to zero. Only GW151226 is inconsistent with zero. These values could be explained if spins are typically misaligned (with the orbital angular momentum or each other) or if the spins are typically small (or both). We know that black holes spins can be large from observations of X-ray binaries, so it would be odd if they are small for binary black holes. Therefore, we have a tentative hint that spins are misaligned. We can’t say why the spins are misaligned, but it is intriguing. With more observations, we’ll be able to confirm if it is the case that spins are typically misaligned, and be able to start pinning down the distribution of spin magnitudes and orientations (as well as the mass distribution). It will probably take a while to be able to say anything definite though, as we’ll probably need about 100 detections. As well as giving us an insight into the properties of black holes, gravitational waves are the perfect tools for testing general relativity. If there are any corrections to general relativity, you’d expect them to be most noticeable under the most extreme conditions, where gravity is strong and spacetime is rapidly changing, exactly as in a binary black hole coalescence. For GW170104 we repeated tests previously performed. Again, we found no evidence of deviations. We added extra terms to to the waveform and constrained their potential magnitudes. The results are pretty much identical to at the end of the first observing run (consistent with zero and hence general relativity). GW170104 doesn’t add much extra information, as GW150914 typically gives the best constraints on terms that modify the post-inspiral part of the waveform (as it is louder), while GW151226 gives the best constraint on the terms which modify the inspiral (as it has the longest inspiral). We also chopped the waveform at a frequency around that of the innermost stable orbit of the remnant black hole, which is about where the transition from inspiral to merger and ringdown occurs, to check if the low frequency and high frequency portions of the waveform give consistent estimates for the final mass and spin. They do. We have also done something slightly new, and tested for dispersion of gravitational waves. We did something similar for GW150914 by putting a limit on the mass of the graviton. Giving the graviton mass is one way of adding dispersion, but we consider other possible forms too. In all cases, results are consistent with there being no dispersion. While we haven’t discovered anything new, we can update our gravitational wave constraint on the graviton mass of less than . AGILE—hard X-ray and gamma-ray follow-up. They didn’t find any gamma-ray signals, but did identify a weak potential X-ray signal occurring about 0.46 s before GW170104. It’s a little odd to have a signal this long before the merger. The team calculate a probability for such a coincident to happen by chance, and find quite a small probability, so it might be interesting to follow this up more (see the INTEGRAL results below), but it’s probably just a coincidence (especially considering how many people did follow-up the event). ANTARES—a search for high-energy muon neutrinos. No counterparts are identified in a ±500 s window around GW170104, or over a ±3 month period. AstroSat-CZTI and GROWTH—a collaboration of observations across a range of wavelengths. They don’t find any hard X-ray counterparts. They do follow up on a bright optical transient ATLASaeu, suggested as a counterpart to GW170104, and conclude that this is a likely counterpart of long, soft gamma-ray burst GRB 170105A. ATLAS and Pan-STARRS—optical follow-up. They identified a bright optical transient 23 hours after GW170104, ATLAS17aeu. This could be a counterpart to GRB 170105A. It seems unlikely that there is any mechanism that could allow for a day’s delay between the gravitational wave emission and an electromagnetic signal. However, the team calculate a small probability (few percent) of finding such a coincidence in sky position and time, so perhaps it is worth pondering. I wouldn’t put any money on it without a distance estimate for the source: assuming it’s a normal afterglow to a gamma-ray burst, you’d expect it to be further away than GW170104’s source. Borexino—a search for low-energy neutrinos. This paper also discusses GW150914 and GW151226. 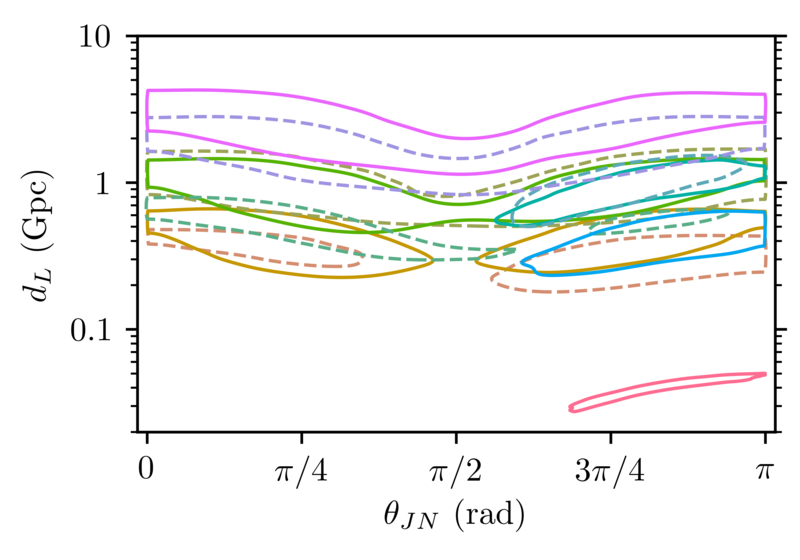 In all cases, the observed rate of neutrinos is consistent with the expected background. CALET—a gamma-ray search. This paper includes upper limits for GW151226, GW170104, GW170608, GW170814 and GW170817. DLT40—an optical search designed for supernovae. This paper covers the whole of O2 including GW170608, GW170814, GW170817 plus GW170809 and GW170823. 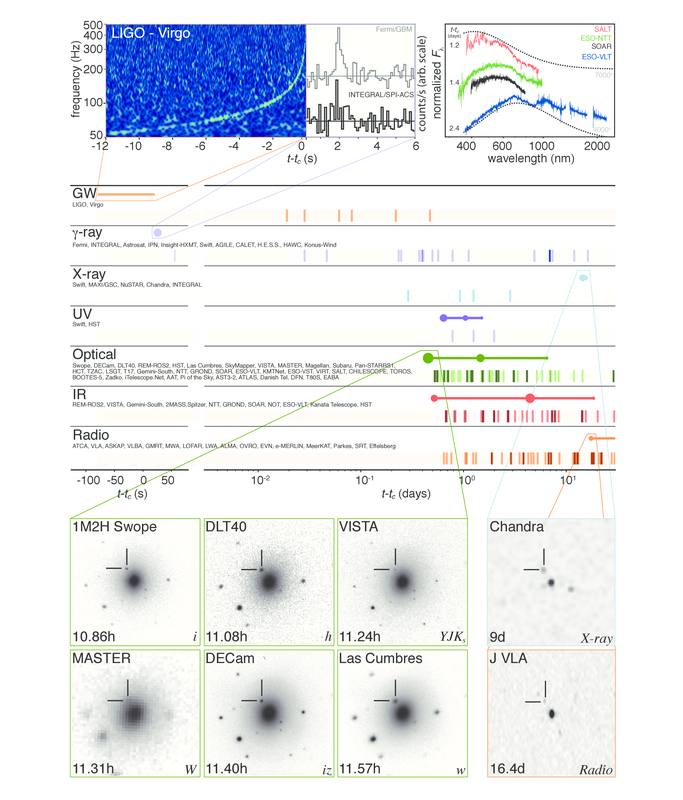 Fermi (GBM and LAT)—gamma-ray follow-up. They covered an impressive fraction of the sky localization, but didn’t find anything. INTEGRAL—gamma-ray and hard X-ray observations. No significant emission is found, which makes the event reported by AGILE unlikely to be a counterpart to GW170104, although they cannot completely rule it out. The intermediate Palomar Transient Factory—an optical survey. While searching, they discovered iPTF17cw, a broad-line type Ic supernova which is unrelated to GW170104 but interesting as it an unusual find. Mini-GWAC—a optical survey (the precursor to GWAC). This paper covers the whole of their O2 follow-up including GW170608. The Owens Valley Radio Observatory Long Wavelength Array—a search for prompt radio emission. TOROS—optical follow-up. They identified no counterparts to GW170104 (although they did for GW170817). If you are interested in what has been reported so far (no compelling counterpart candidates yet to my knowledge), there is an archive of GCN Circulars sent about GW170104. The discoveries of the first observing run were not a fluke. There really is a population of stellar mass black holes with masses above out there, and we can study them with gravitational waves. Binary black hole spins may be typically misaligned or small. This is not certain yet, but it is certainly worth investigating potential mechanisms that could cause misalignment. General relativity still works, even after considering our new tests. If someone asks you to write a discovery paper, run. Run and do not look back. If you’re looking for the most up-to-date results regarding GW170104, check out the O2 Catalogue Paper. Gravitational wave signals (at least the short ones, which are all that we have so far), are named by their detection date. GW170104 was discovered 2017 January 4. This isn’t too catchy, but is at least better than the ID number in our database of triggers (G268556) which is used in corresponding with our astronomer partners before we work out if the “GW” title is justified. Previous detections have attracted nicknames, but none has stuck for GW170104. Archisman Ghosh suggested the Perihelion Event, as it was detected a few hours before the Earth reached its annual point closest to the Sun. I like this name, its rather poetic. I would like to thank the wi-fi of Chiltern Railways for their role in producing the preliminary sky map. I had arranged to visit London for the weekend (because my rota slot was likely to be quiet… ), and was frantically working on the way down to check results so they could be sent out. I’d also like to thank John Veitch for putting together the final map while I was stuck on the Underground. The parameter estimation analysis works by matching a template waveform to the data to see how well it matches. The results are therefore sensitive to your waveform model, and whether they include all the relevant bits of physics. SEOBNRv2 has spins either aligned or antialigned with the orbital angular momentum. Therefore, there is no precession (wobbling of orientation, like that of a spinning top) of the system. IMRPhenomPv2 includes an approximate description of precession, packaging up the most important information about precession into a single parameter . For GW150914, we also performed a follow-up analysis using a much more expensive waveform SEOBNRv3 which more fully includes the effect of both spins on precession. These results weren’t ready at the time of the announcement, because the waveform is laborious to run. For GW170104, there were discussions that using a spin-aligned waveform was old hat, and that we should really only use the two precessing models. Hence, we started on the endeavour of producing SEOBNRv3 results. Fortunately, the code has been sped up a little, although it is still not quick to run. I am extremely grateful to Scott Coughlin (one of the folks behind Gravity Spy), Andrea Taracchini and Stas Babak for taking charge of producing results in time for the paper, in what was a Herculean effort. I spent a few sleepless nights, trying to calculate if the analysis was converging quickly enough to make our target submission deadline, but it did work out in the end. Still, don’t necessarily expect we’ll do this for a all future detections. Since the waveforms have rather scary technical names, in the paper we refer to IMRPhenomPv2 as the effective precession model and SEOBNRv3 as the full precession model. 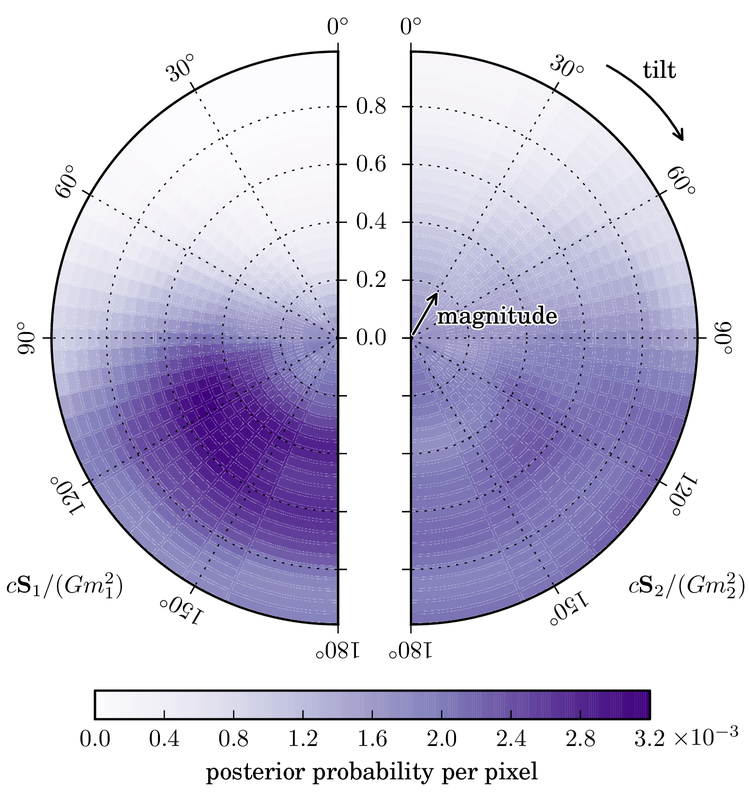 Distance measurements for gravitational wave sources have significant uncertainties. The distance is difficult to measure as it determined from the signal amplitude, but this is also influences by the binary’s inclination. A signal could either be close and edge on or far and face on-face off. Estimated luminosity distance and binary inclination angle . The two-dimensional shows the probability distribution for GW170104 as well as 50% and 90% contours. The one-dimensional plot shows results using different waveform models. The dotted lines mark the edge of our 90% probability intervals. Figure 4 of the GW170104 Supplemental Material (Figure 9 of the arXiv version). The uncertainty on the distance rather awkwardly means that we can’t definitely say that GW170104 came from a further source than GW150914 or GW151226, but it’s a reasonable bet. The 90% credible intervals on the distances are 250–570 Mpc for GW150194, 250–660 Mpc for GW151226, 490–1330 Mpc for GW170104 and 500–1500 Mpc for LVT151012. Translating from a luminosity distance to a travel time (gravitational waves do travel at the speed of light, our tests of dispersion are consistent wit that! ), the GW170104 black holes merged somewhere between 1.3 and 3.0 billion years ago. This is around the time that multicellular life first evolved on Earth, and means that black holes have been colliding longer than life on Earth has been reproducing sexually. A first draft of the paper (version 2; version 1 was a copy-and-paste of the Boxing Day Discovery Paper) was circulated to the Compact Binary Coalescence and Burst groups for comments on 4 March. This was still a rough version, and we wanted to check that we had a good outline of the paper. The main feedback was that we should include more about the astrophysical side of things. I think the final paper has a better balance, possibly erring on the side of going into too much detail on some of the more subtle points (but I think that’s better than glossing over them). A first proper draft (version 3) was released to the entire Collaboration on 12 March in the middle of our Collaboration meeting in Pasadena. We gave an oral presentation the next day (I doubt many people had read the paper by then). Collaboration papers are usually allowed two weeks for people to comment, and we followed the same procedure here. That was not a fun time, as there was a constant trickle of comments. I remember waking up each morning and trying to guess how many emails would be in my inbox–I normally low-balled this. I wasn’t too happy with version 3, it was still rather rough. The members of the Paper Writing Team had been furiously working on our individual tasks, but hadn’t had time to look at the whole. I was much happier with the next draft (version 4). It took some work to get this together, following up on all the comments and trying to address concerns was a challenge. It was especially difficult as we got a series of private comments, and trying to find a consensus probably made us look like the bad guys on all sides. We released version 4 on 14 April for a week of comments. The next step was approval by the LIGO and Virgo executive bodies on 24 April. We prepared version 5 for this. By this point, I had lost track of which sentences I had written, which I had merely typed, and which were from other people completely. There were a few minor changes, mostly adding technical caveats to keep everyone happy (although they do rather complicate the flow of the text). The paper was circulated to the Collaboration for a final week of comments on 26 April. Most comments now were about typos and presentation. However, some people will continue to make the same comment every time, regardless of how many times you explain why you are doing something different. The end was in sight! The paper was submitted to Physical Review Letters on 9 May. I was hoping that the referees would take a while, but the reports were waiting in my inbox on Monday morning. The referee reports weren’t too bad. Referee A had some general comments, Referee B had some good and detailed comments on the astrophysics, and Referee C gave the paper a thorough reading and had some good suggestions for clarifying the text. By this point, I have been staring at the paper so long that some outside perspective was welcome. I was hoping that we’d have a more thorough review of the testing general relativity results, but we had Bob Wald as one of our Collaboration Paper reviewers (the analysis, results and paper are all reviewed internally), so I think we had already been held to a high standard, and there wasn’t much left to say. We put together responses to the reports. There were surprisingly few comments from the Collaboration at this point. I guess that everyone was getting tired. The paper was resubmitted and accepted on 20 May. One of the suggestions of Referee A was to include some plots showing the results of the searches. People weren’t too keen on showing these initially, but after much badgering they were convinced, and it was decided to put these plots in the Supplemental Material which wouldn’t delay the paper as long as we got the material submitted by 26 May. This seemed like plenty of time, but it turned out to be rather frantic at the end (although not due to the new plots). The video below is an accurate representation of us trying to submit the final version. I have an email which contains the line “Many Bothans died to bring us this information” from 1 hour and 18 minutes before the final deadline. After this, things were looking pretty good. We had returned the proofs of the main paper (I had a fun evening double checking the author list. Yes, all of them). We were now on version 11 of the paper. Of course, there’s always one last thing. On 31 May, the evening before publication, Salvo Vitale spotted a typo. Nothing serious, but annoying. The team at Physical Review Letters were fantastic, and took care of it immediately! Looking back, it is clear that the principal bottle-neck in publishing the results is getting the Collaboration to converge on the paper. I’m not sure how we can overcome this… Actually, I have some ideas, but none that wouldn’t involve some form of doomsday device. The sensitivities of the LIGO Hanford and Livinston detectors are around the same as they were in the first observing run. After the success of the first observing run, the second observing run is the difficult follow up album. Livingston has got a little better, while Hanford is a little worse. This is because the Livingston team concentrate on improving low frequency sensitivity whereas the Hanford team focused on improving high frequency sensitivity. The Hanford team increased the laser power, but this introduces some new complications. The instruments are extremely complicated machines, and improving sensitivity is hard work. The current plan is to have a long commissioning break after the end of this run. The low frequency tweaks from Livingston will be transferred to Hanford, and both sites will work on bringing down other sources of noise. While the sensitivity hasn’t improved as much as we might have hoped, the calibration of the detectors has! In the first observing run, the calibration uncertainty for the first set of published results was about 10% in amplitude and 10 degrees in phase. Now, uncertainty is better than 5% in amplitude and 3 degrees in phase, and people are discussing getting this down further. As the binary inspirals, the orientation of the spins will evolve as they precess about. We always quote measurements of the spins at a point in the inspiral corresponding to a gravitational wave frequency of 20 Hz. This is most convenient for our analysis, but you can calculate the spins at other points. However, the resulting probability distributions are pretty similar at other frequencies. This is because the probability distributions are primarily determined by the combination of three things: (i) our prior assumption of a uniform distribution of spin orientations, (ii) our measurement of the effective inspiral spin, and (iii) our measurement of the mass ratio. A uniform distribution stays uniform as spins evolve, so this is unaffected, the effective inspiral spin is approximately conserved during inspiral, so this doesn’t change much, and the mass ratio is constant. The overall picture is therefore qualitatively similar at different moments during the inspiral. I love footnotes. It was challenging for me to resist having any in the paper. 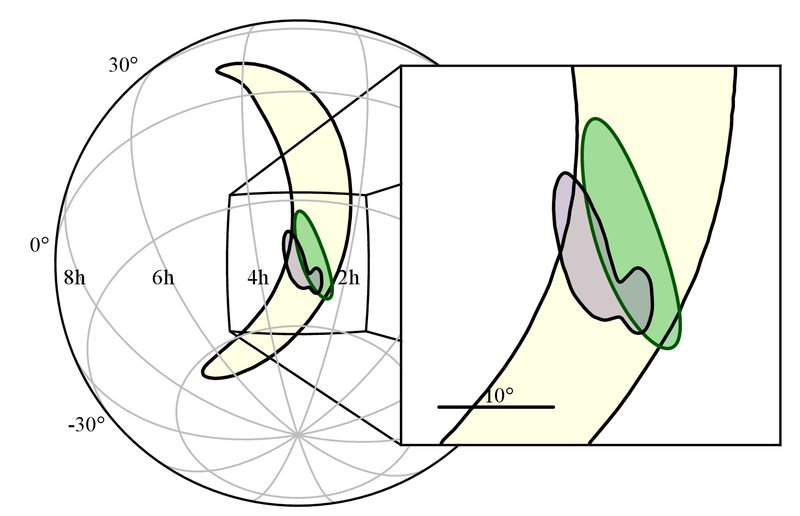 It is possible that internal gravity waves (that is oscillations of the material making up the star, where the restoring force is gravity, not gravitational waves, which are ripples in spacetime), can transport angular momentum from the core of a star to its outer envelope, meaning that the two could rotate in different directions (Rogers, Lin & Lau 2012). I don’t think anyone has studied this yet for the progenitors of binary black holes, but it would be really cool if gravity waves set the properties of gravitational wave sources. I really don’t want to proof read the paper which explains this though. For our plots, we use a consistent colour coding for our events. 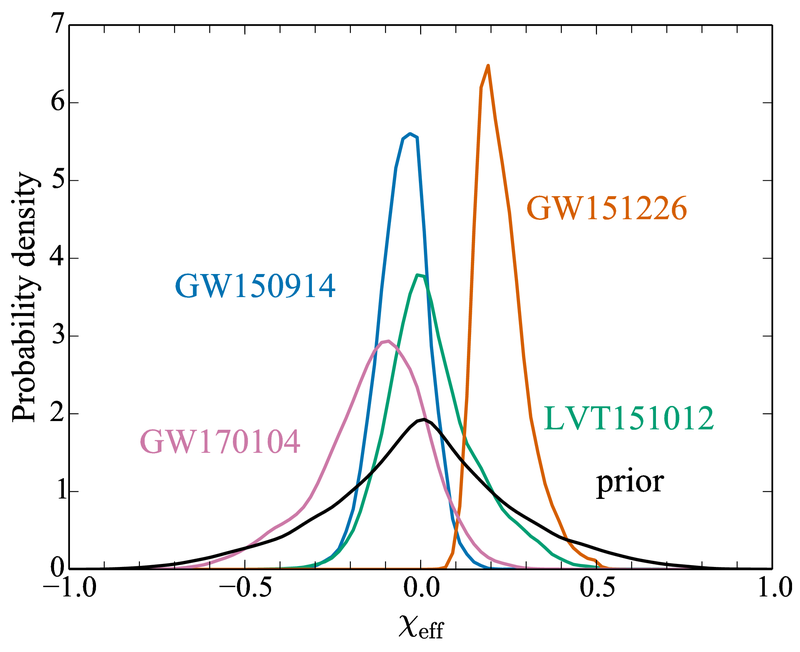 GW150914 is blue; LVT151012 is green; GW151226 is red–orange, and GW170104 is purple. The colour scheme is designed to be colour blind friendly (although adopting different line styles would perhaps be more distinguishable), and is implemented in Python in the Seaborn package as colorblind. Katerina Chatziioannou, who made most of the plots showing parameter estimation results is not a fan of the colour combinations, but put a lot of patient effort into polishing up the plots anyway.